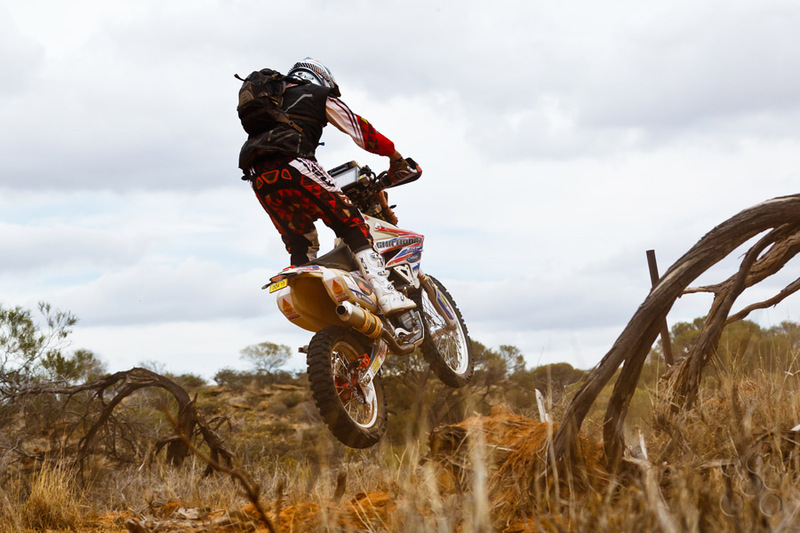 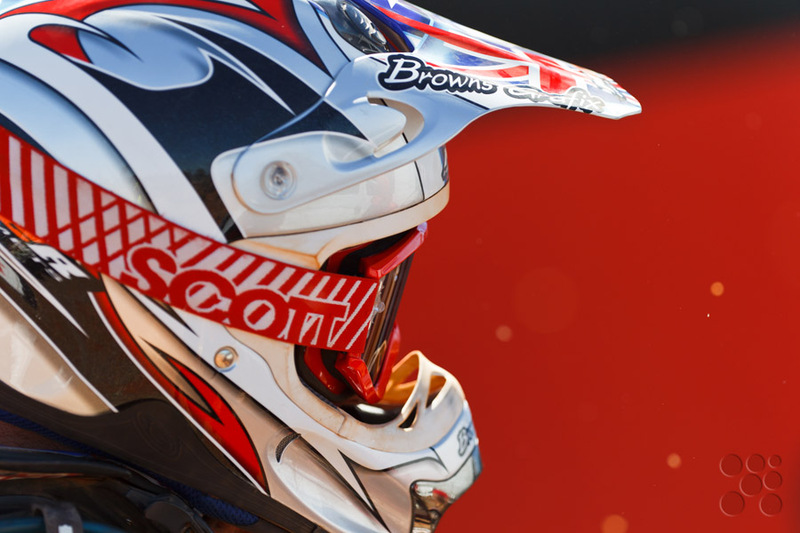 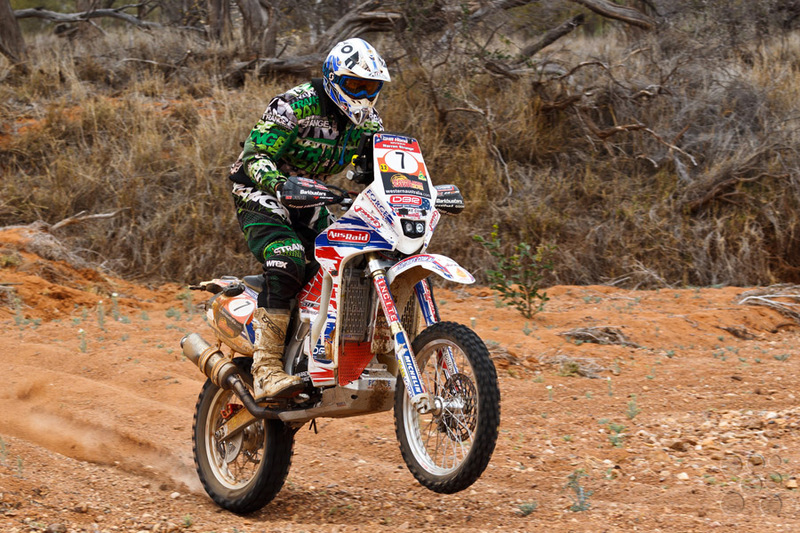 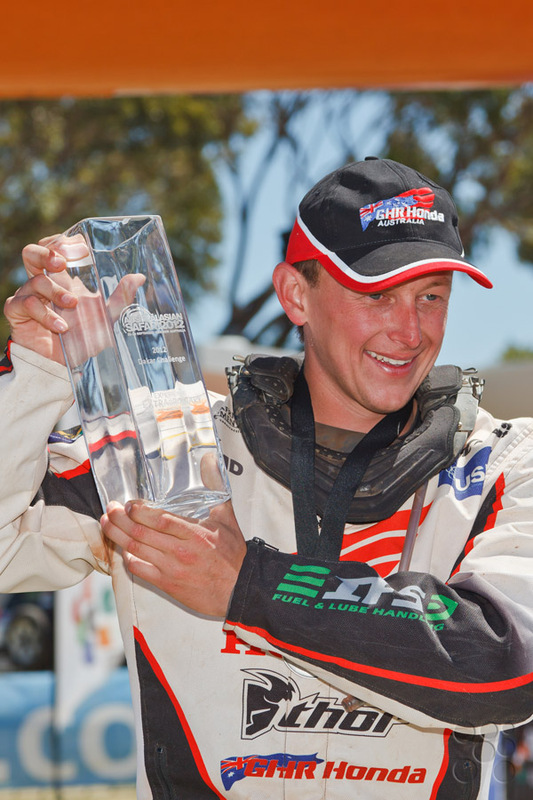 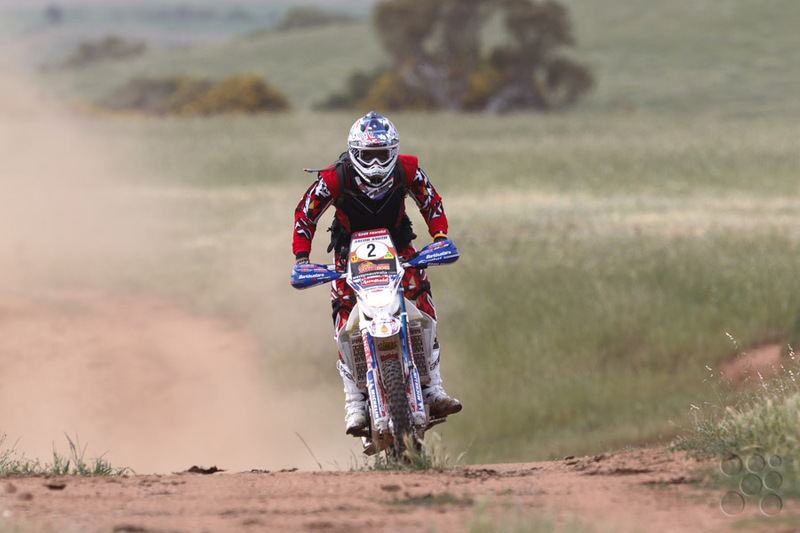 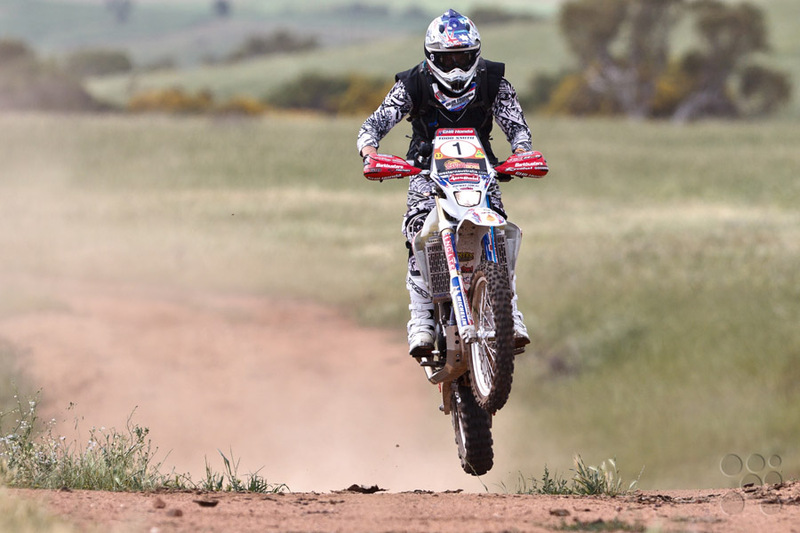 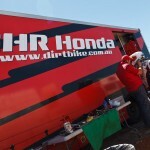 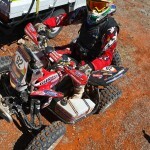 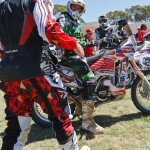 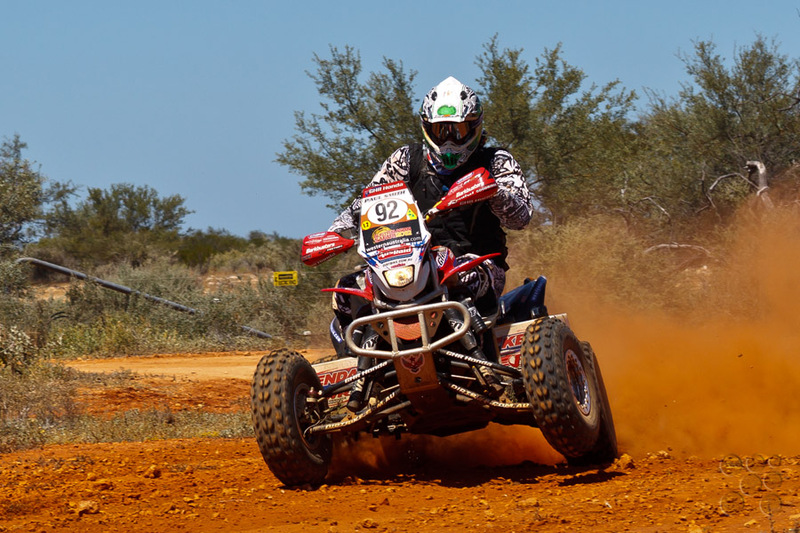 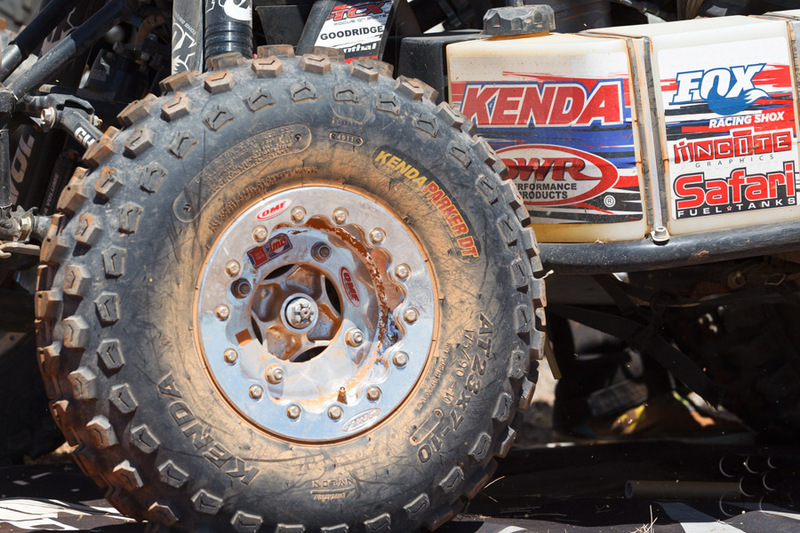 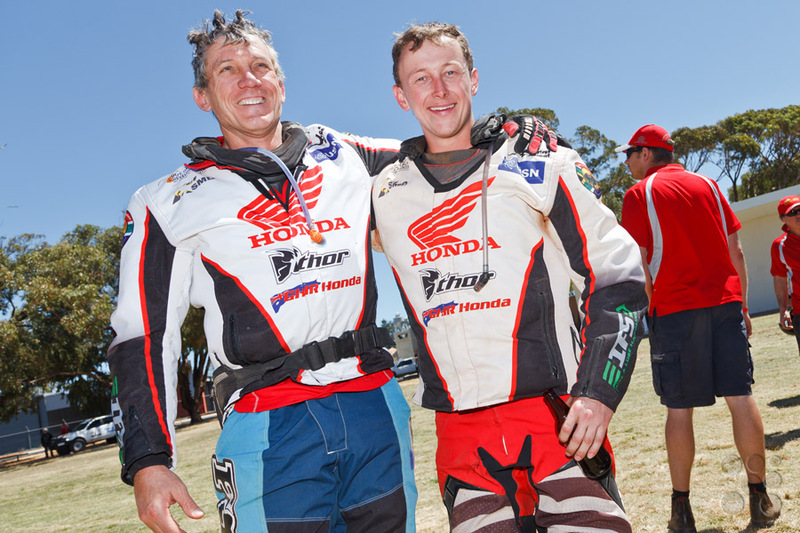 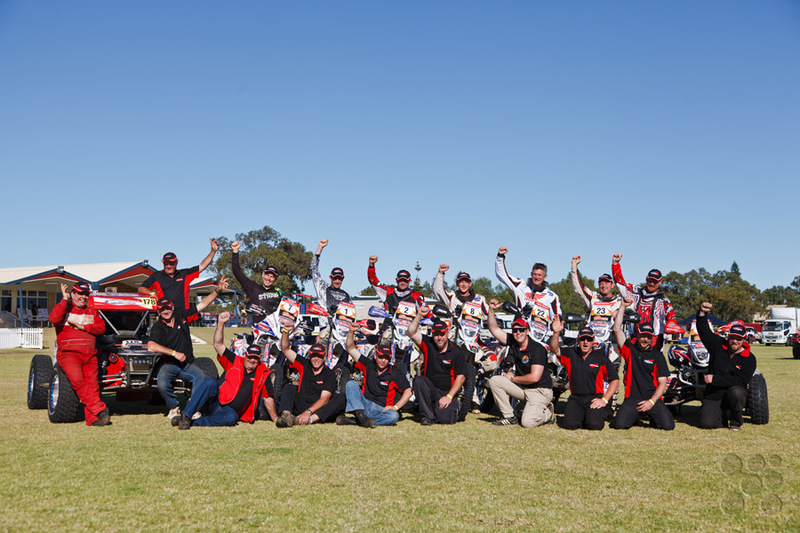 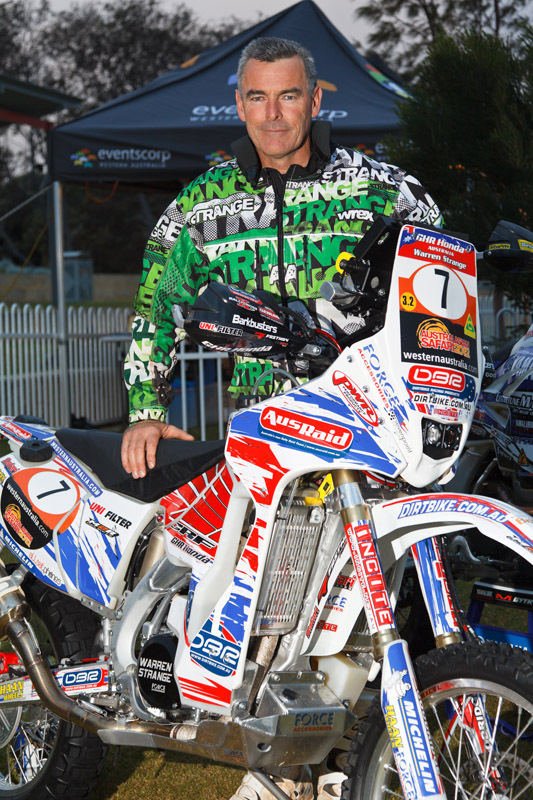 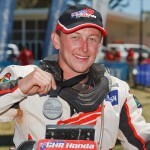 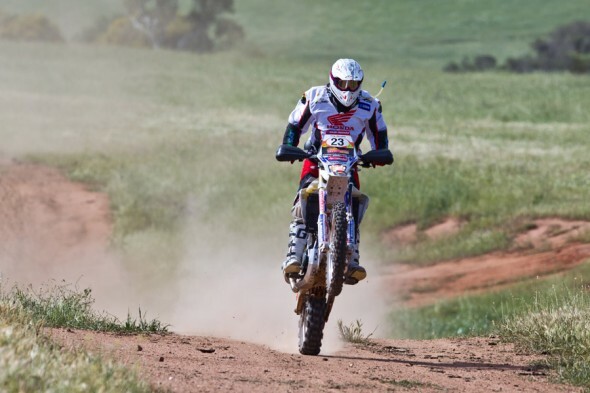 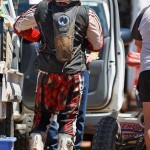 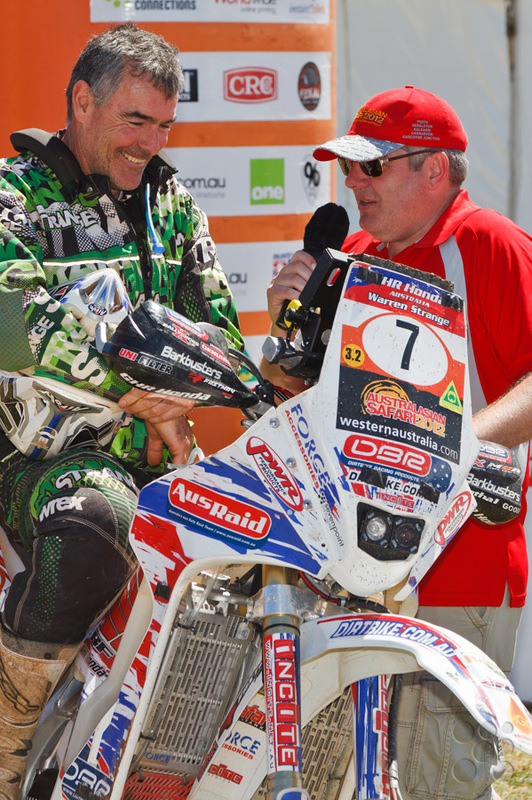 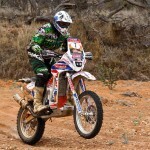 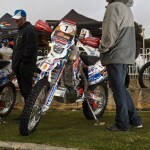 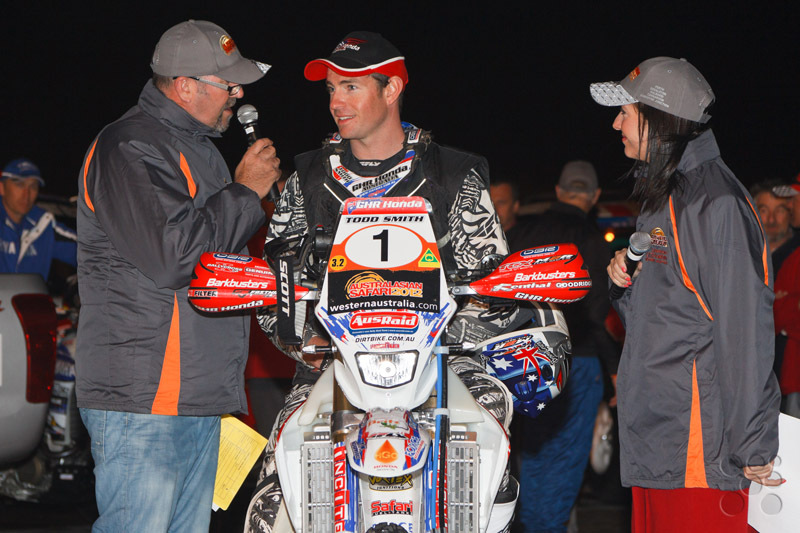 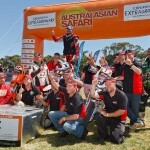 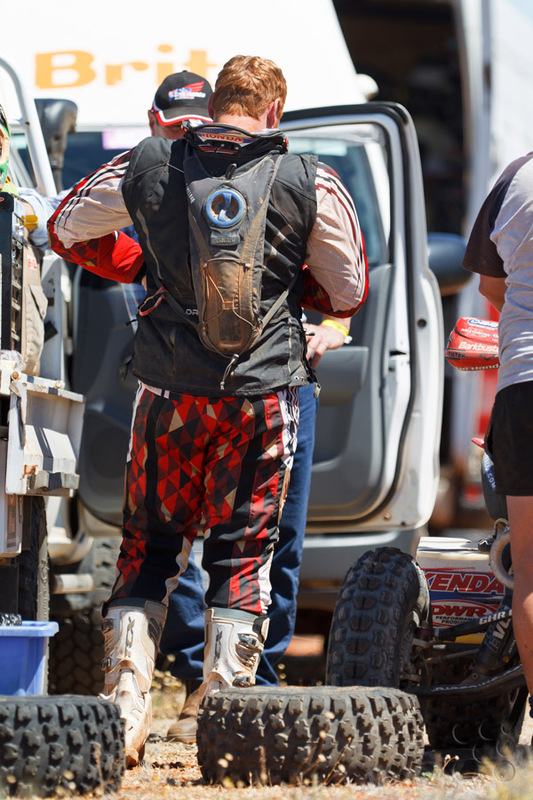 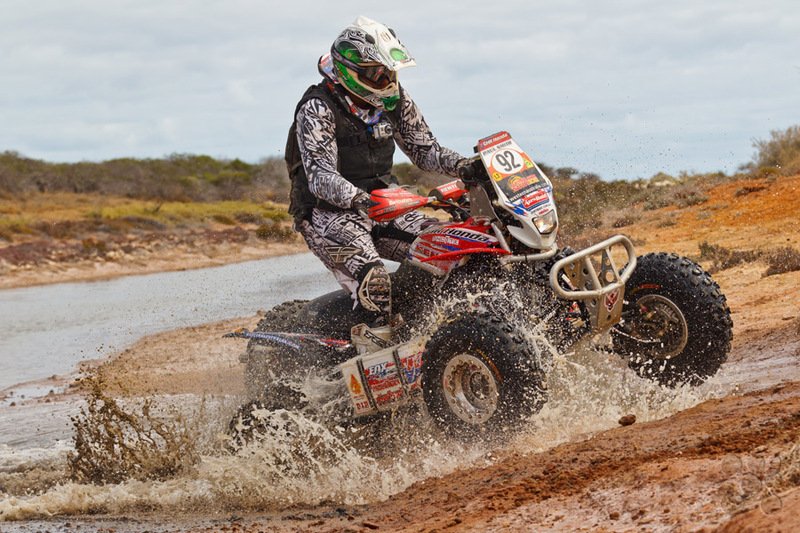 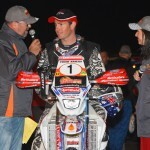 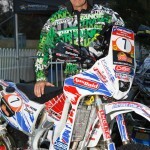 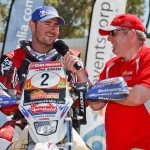 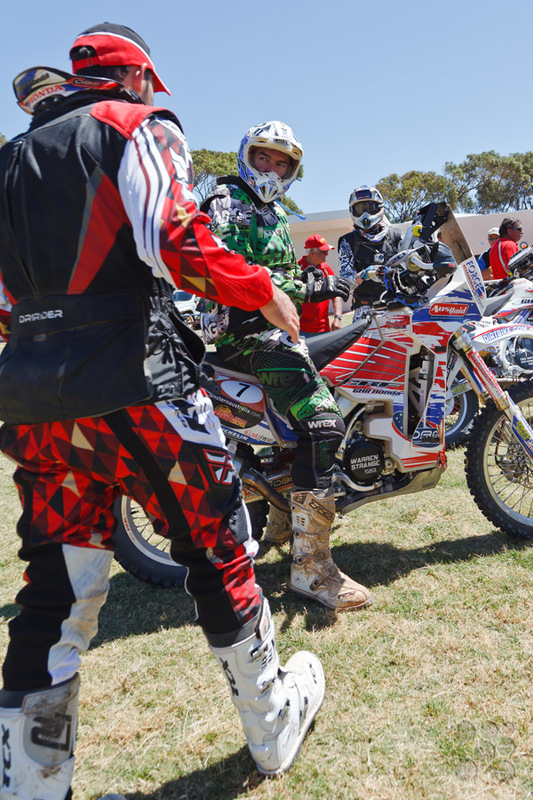 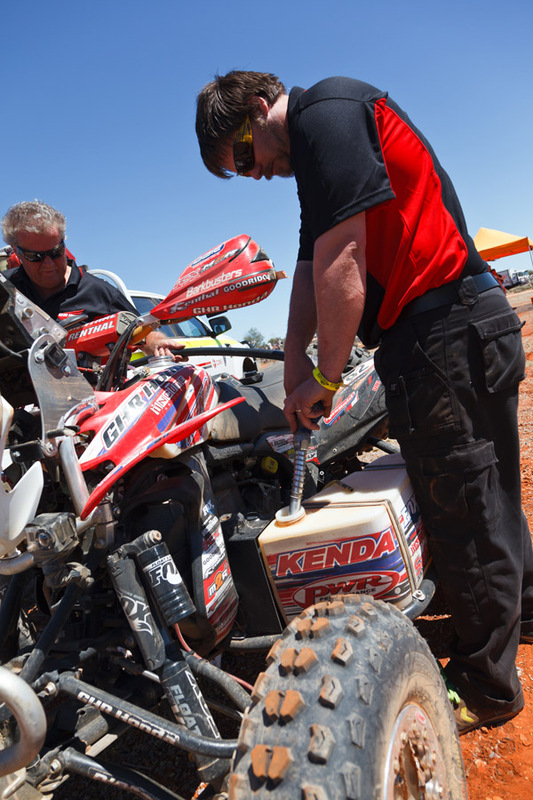 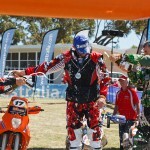 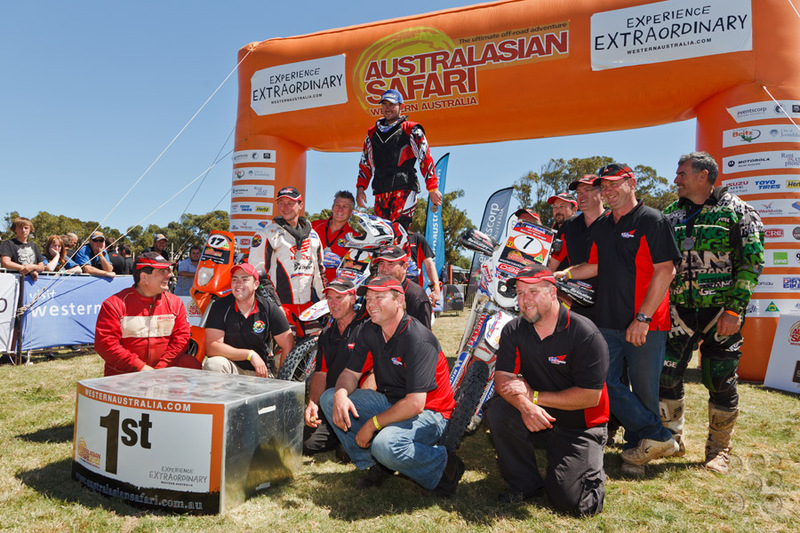 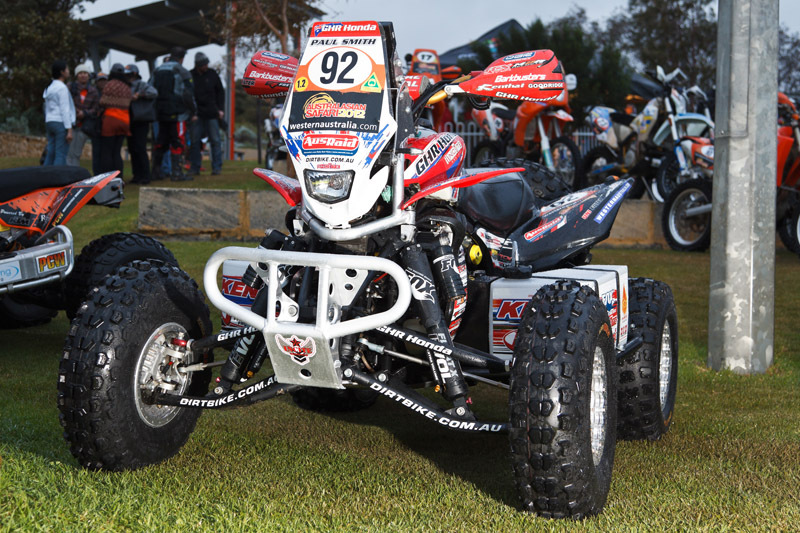 Australia’s toughest offroad event, the Australasian Safari 2012 has been run and won again by GHR Honda’s Jacob Smith aboard his CRF450X. 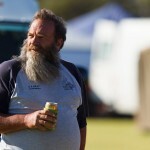 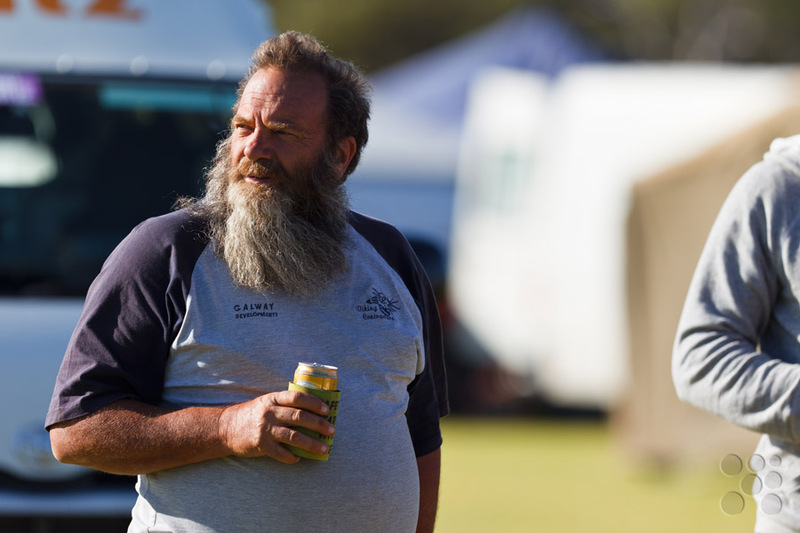 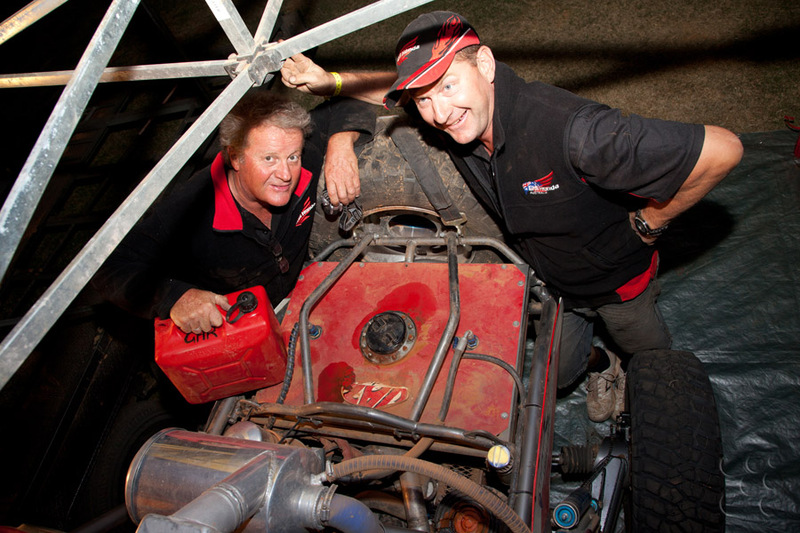 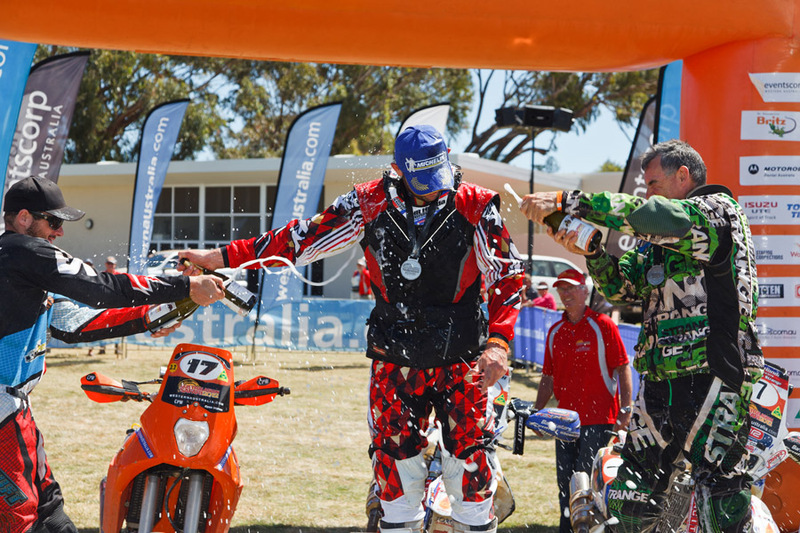 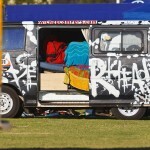 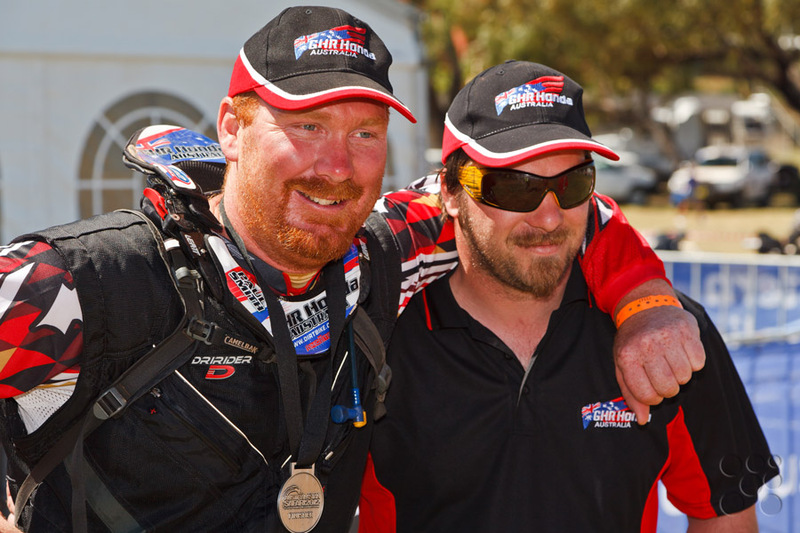 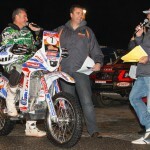 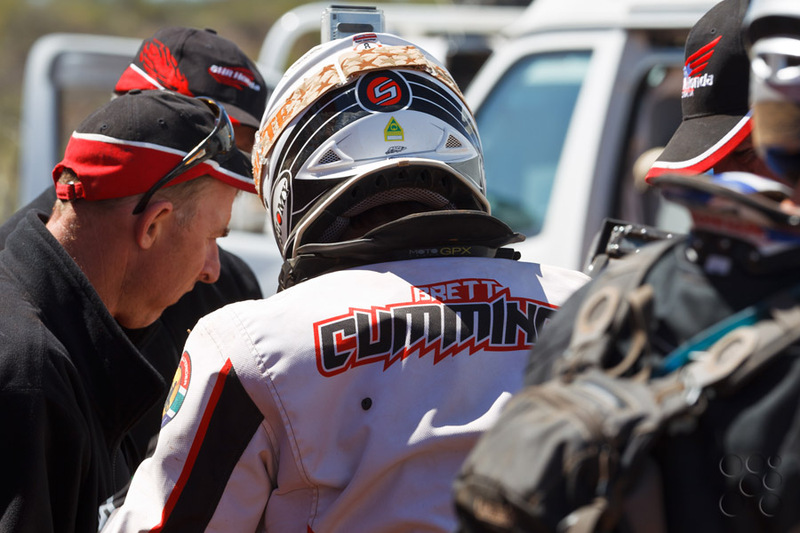 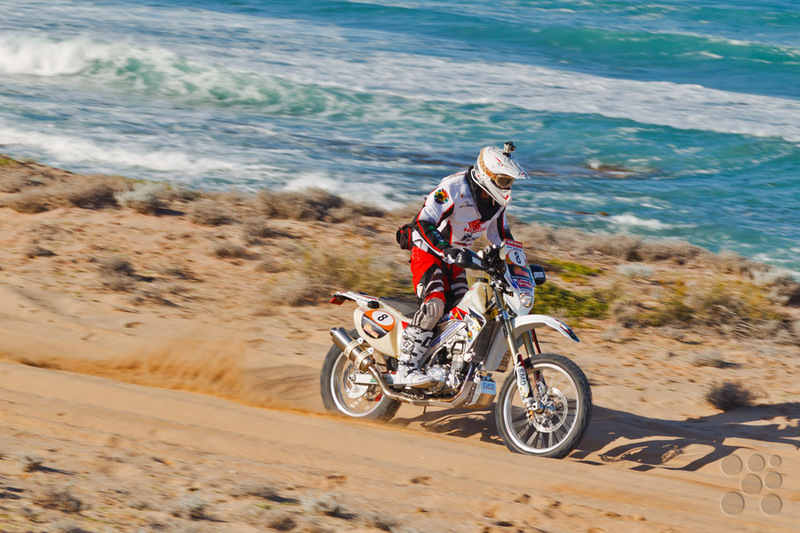 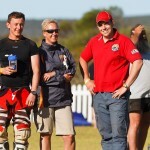 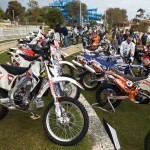 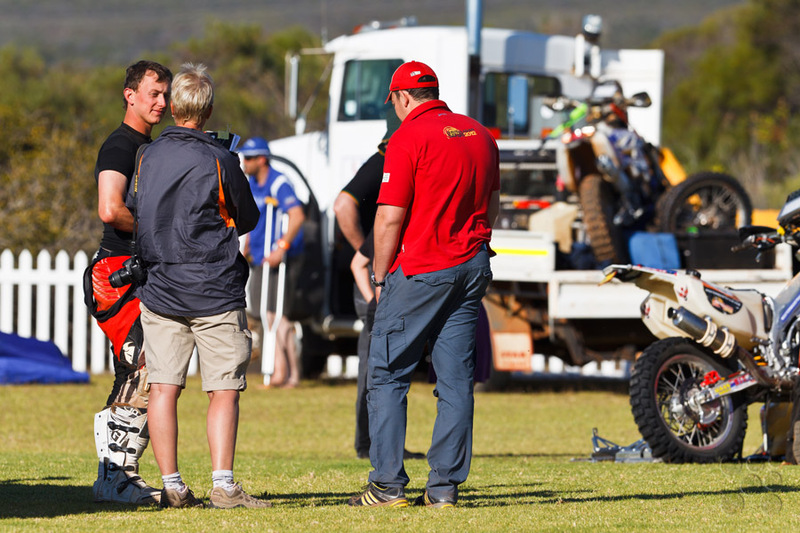 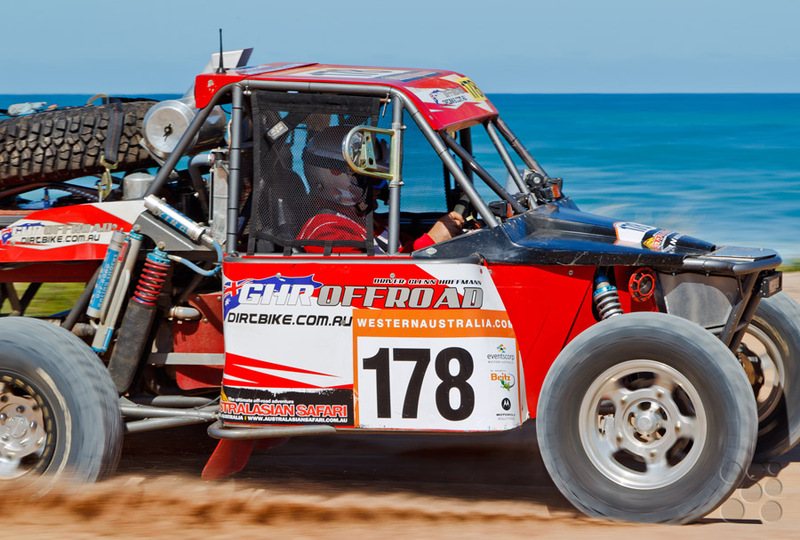 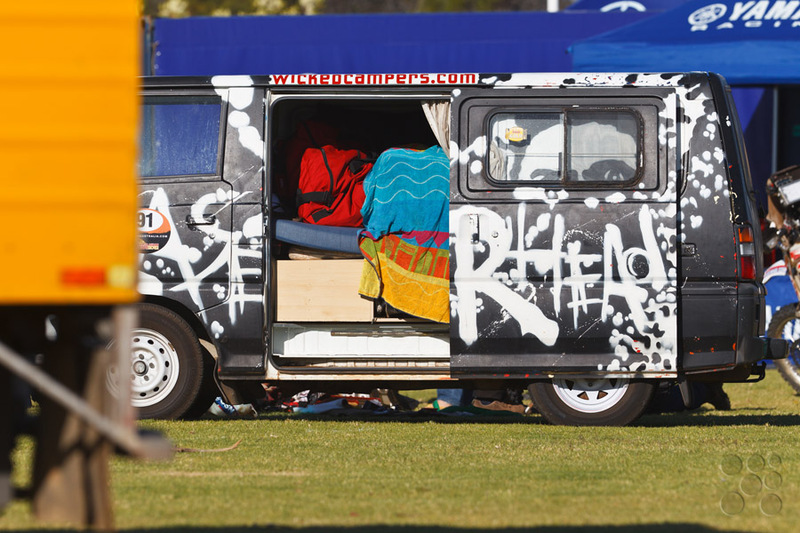 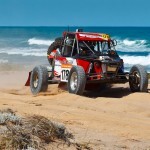 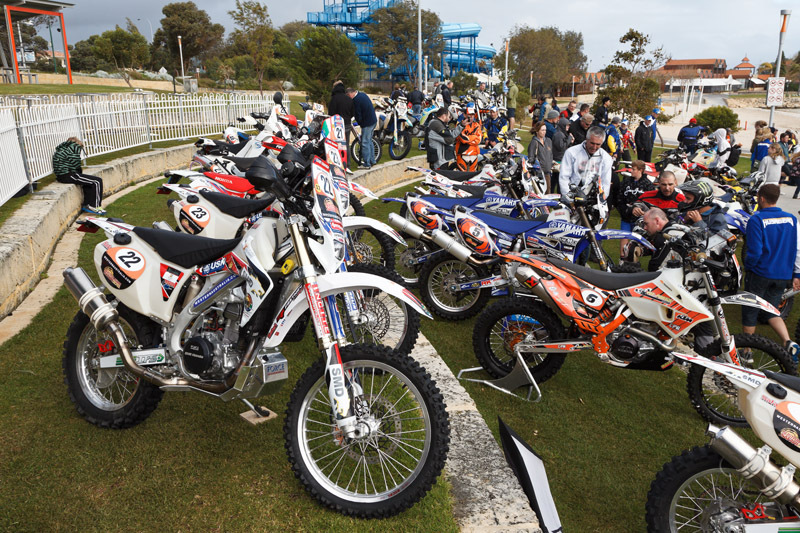 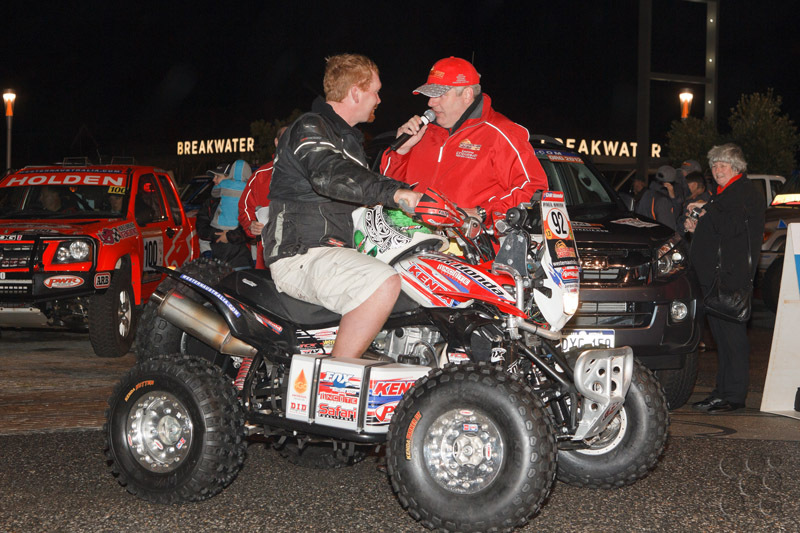 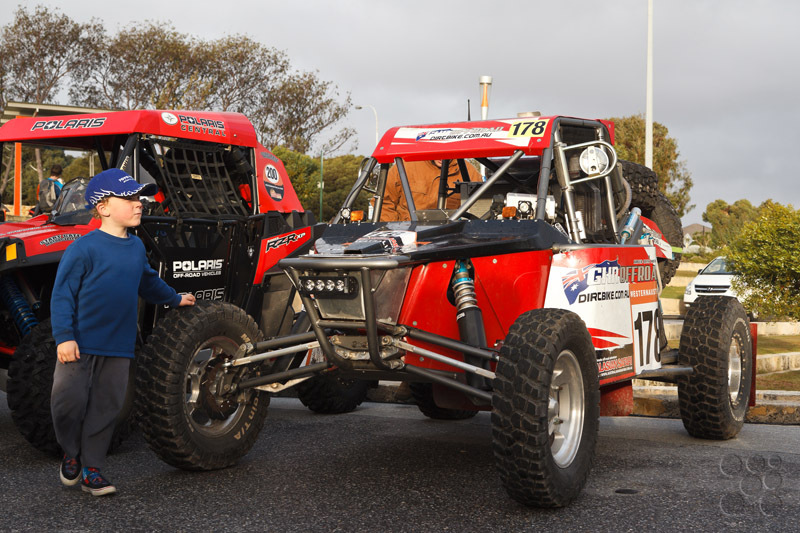 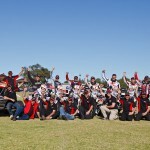 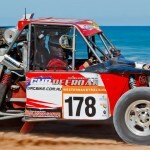 Two short beach stages concluded the approximately 3,500 competitive kilometres and brought the field south to Geraldton. 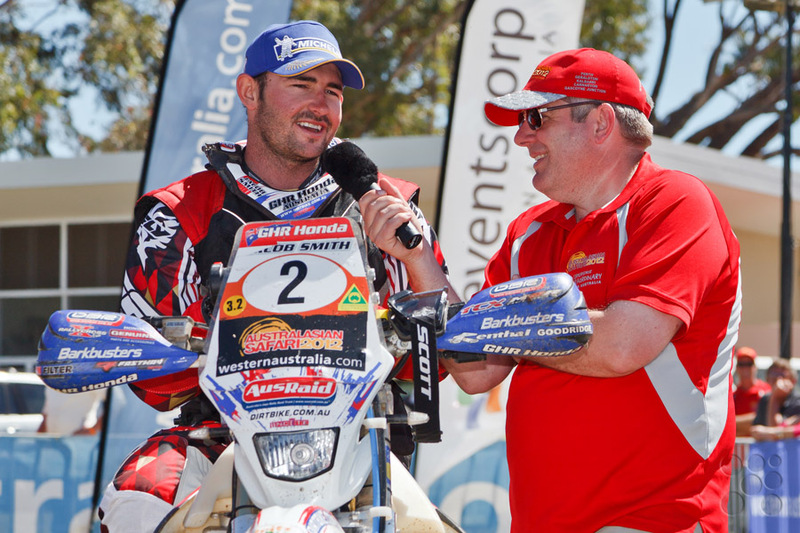 24 year old Jacob Smith dominated from day 1 and never looked back until the race finish. With one previous win and multiple podiums, Jacob’s experience and a cool head allowed a measured ride from the very beginning and by the end of the race his 31 minute lead had become unassailable. 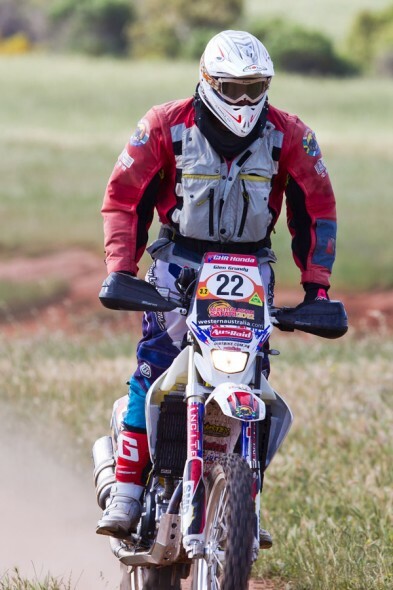 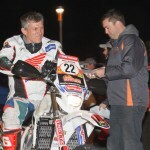 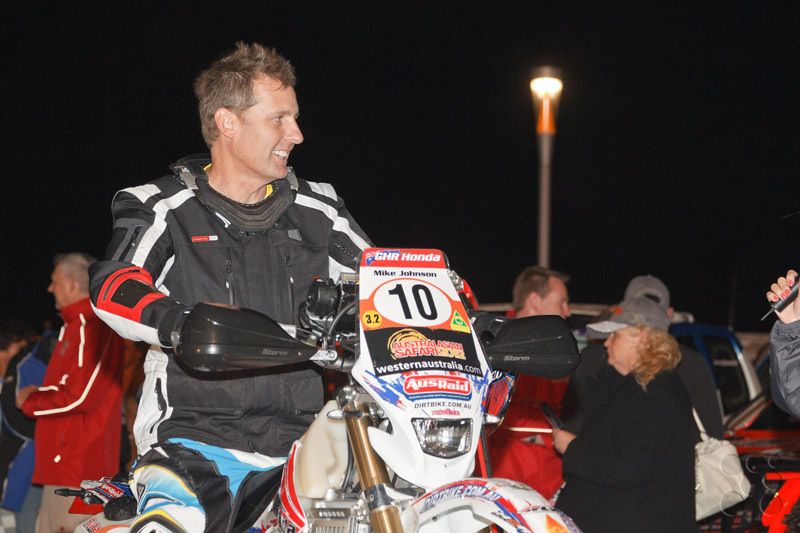 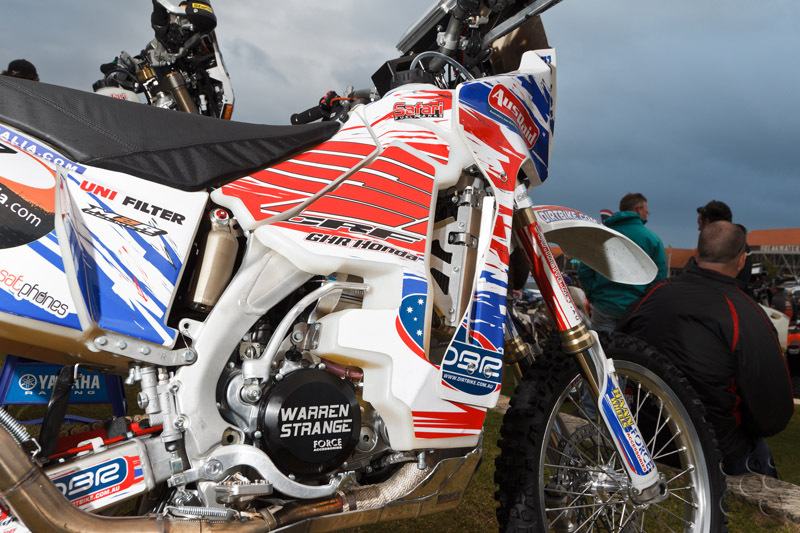 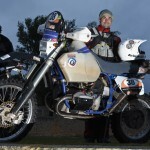 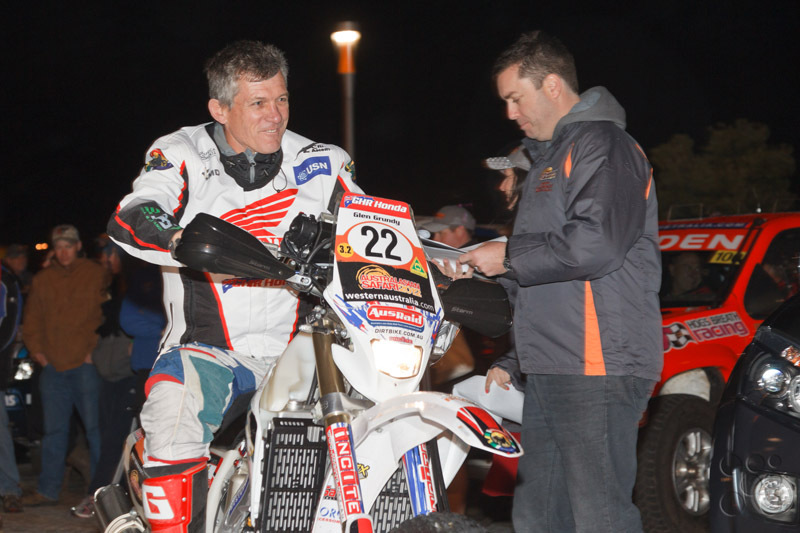 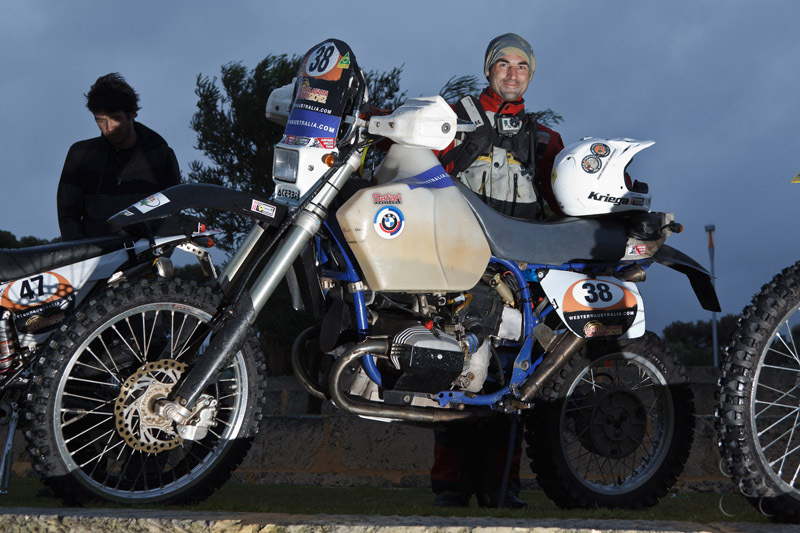 Following Jacob into second place is 47 year old veteran rider Warren Strange who had approached this race as a testing ground for his GHR developed CRF450X Dakar Rally bike before his second attempt at Dakar next year. 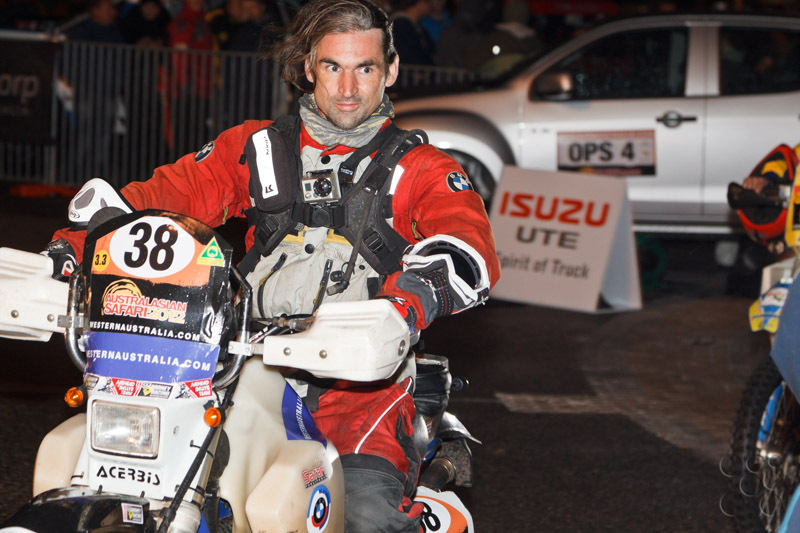 Despite his policy of not taking risks, Strange finished over one and half hours ahead of third place. 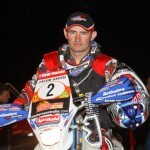 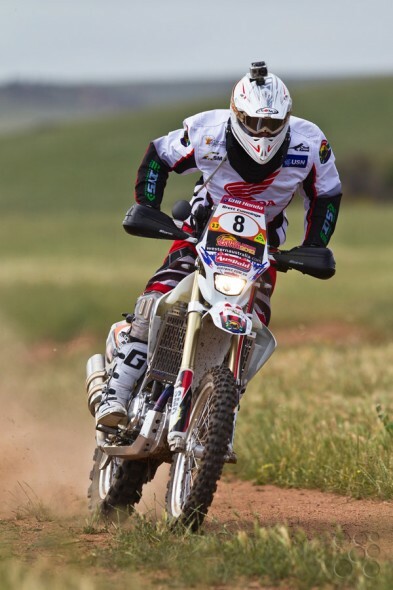 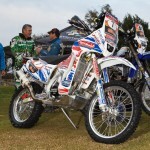 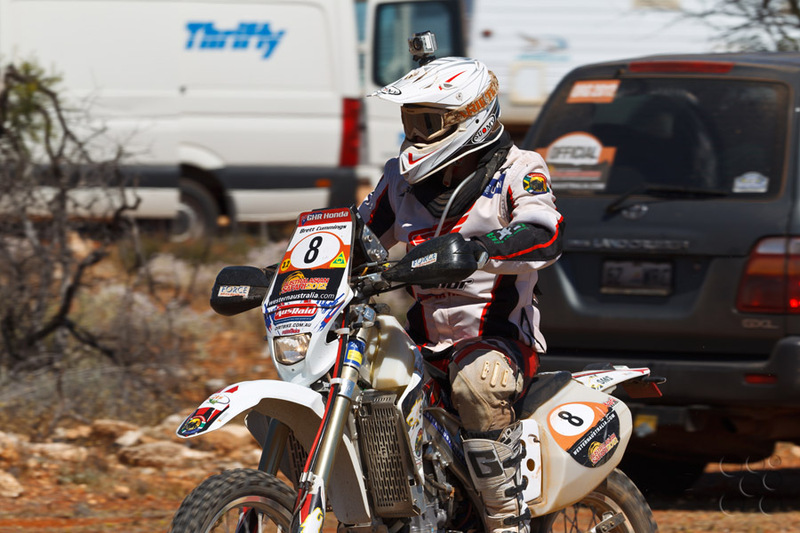 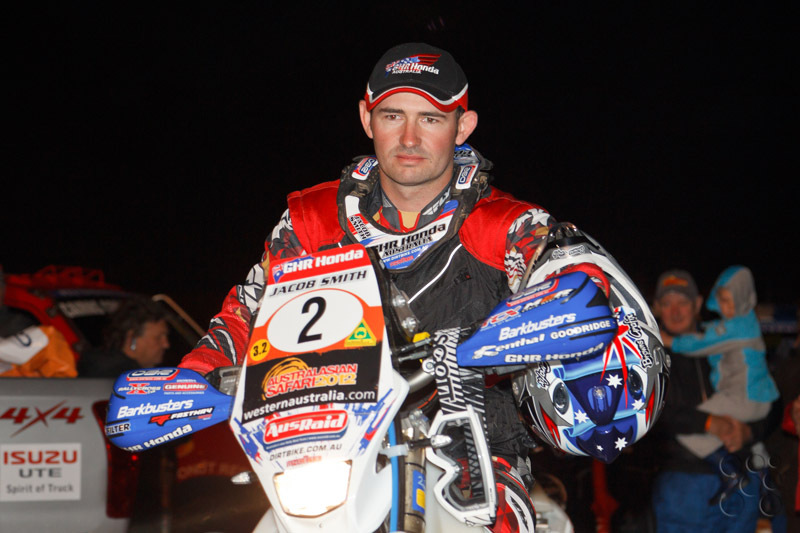 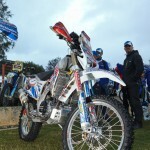 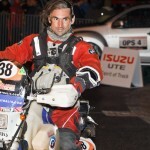 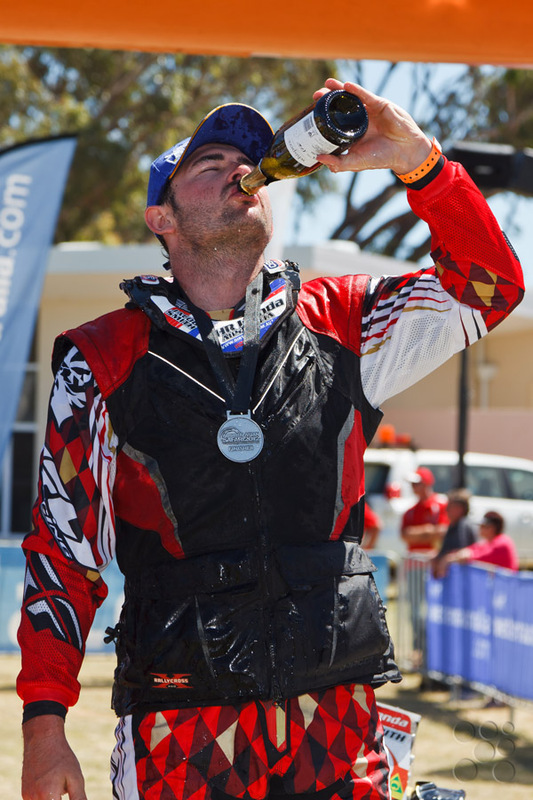 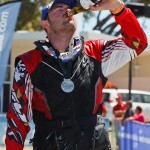 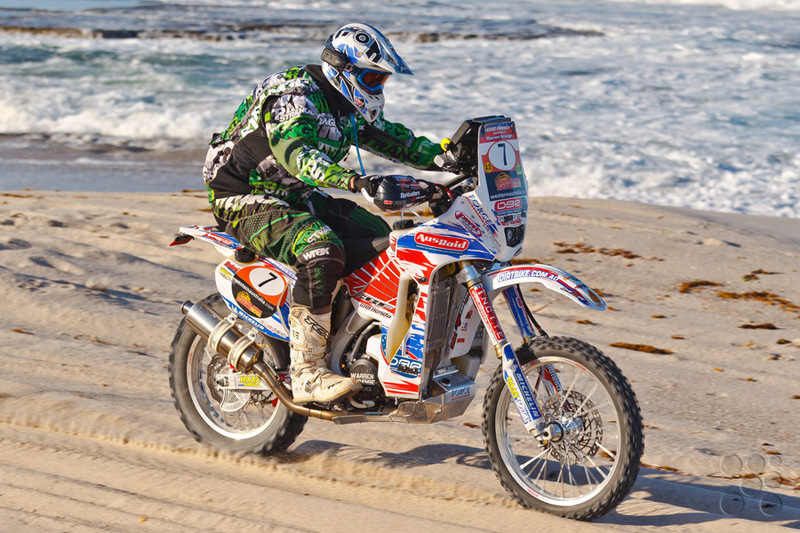 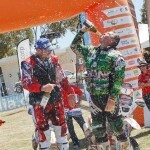 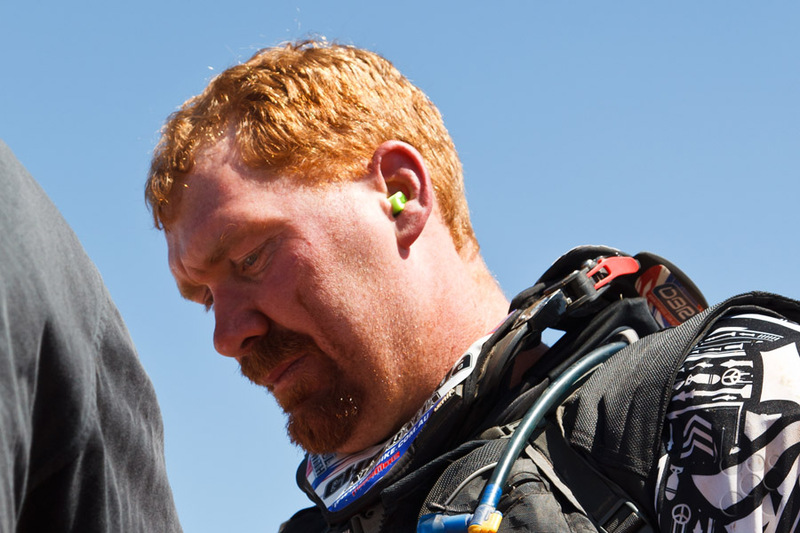 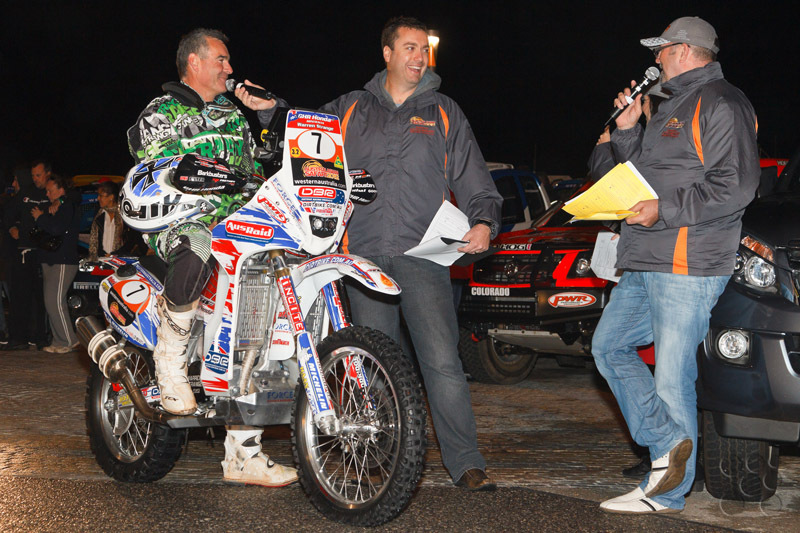 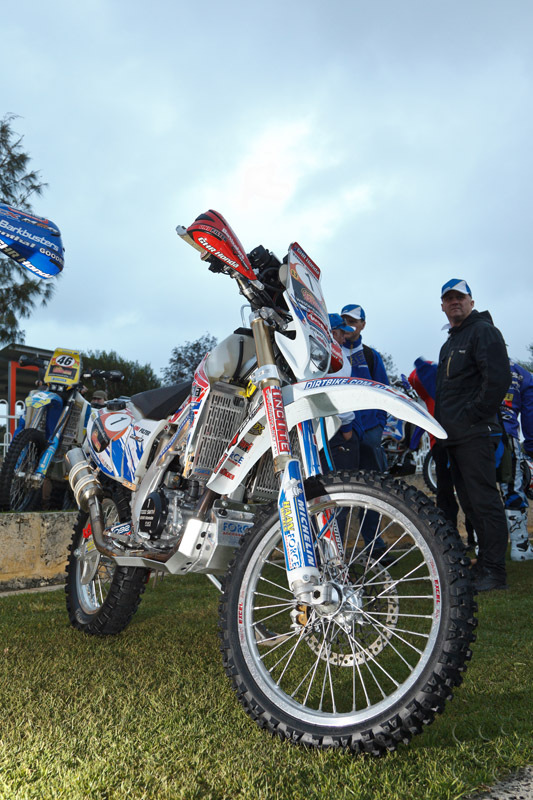 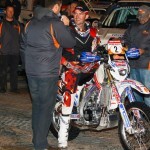 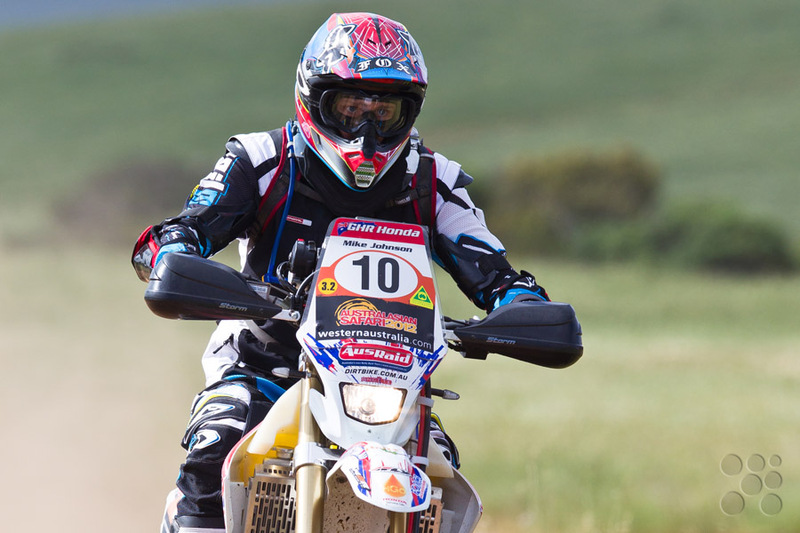 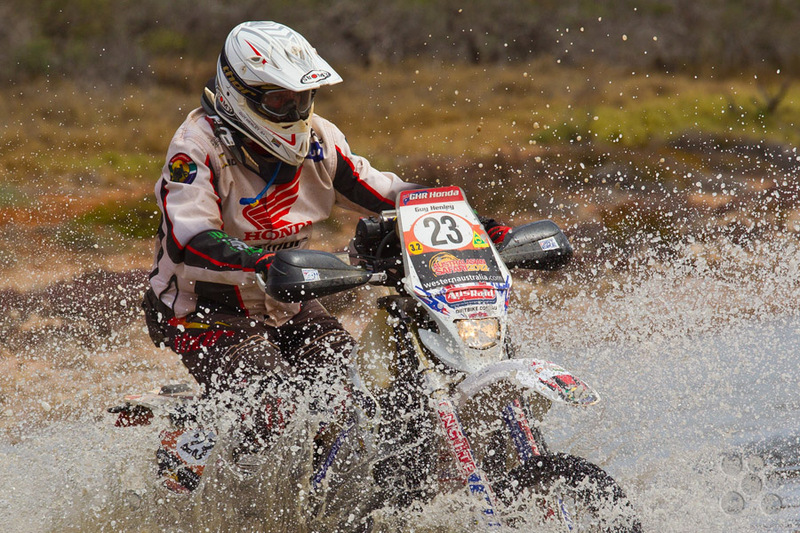 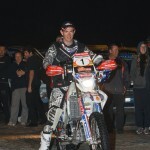 South African rider Brett Cummings (29) finished in fourth place overall, but importantly took out the Dakar Challenge – a sub-category victory at Safari which will pay his entry to the 2013 Dakar Rally. 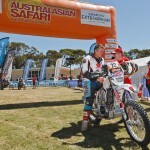 It’s an especially pleasing result for Cummings after he was unable to start Safari last year through injury, making this is his first multi-day navigational event. 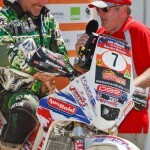 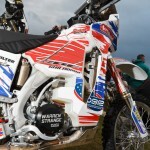 Compatriot Guy Henley placed ninth overall and put a fourth GHR Honda CRF450X in the top ten. 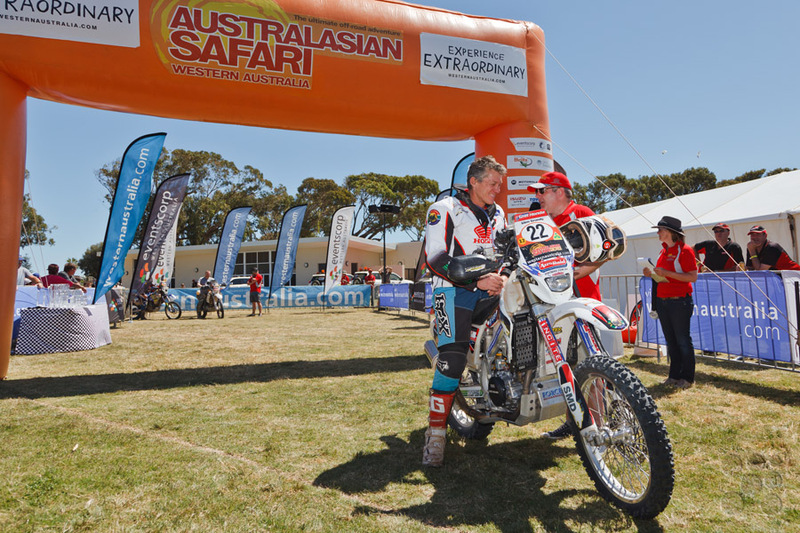 Also from South Africa is journeyman Glen Grundy (48) who successfully conquered Safari after bowing out due to injury last year. 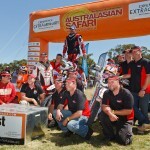 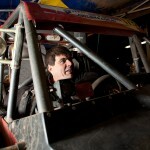 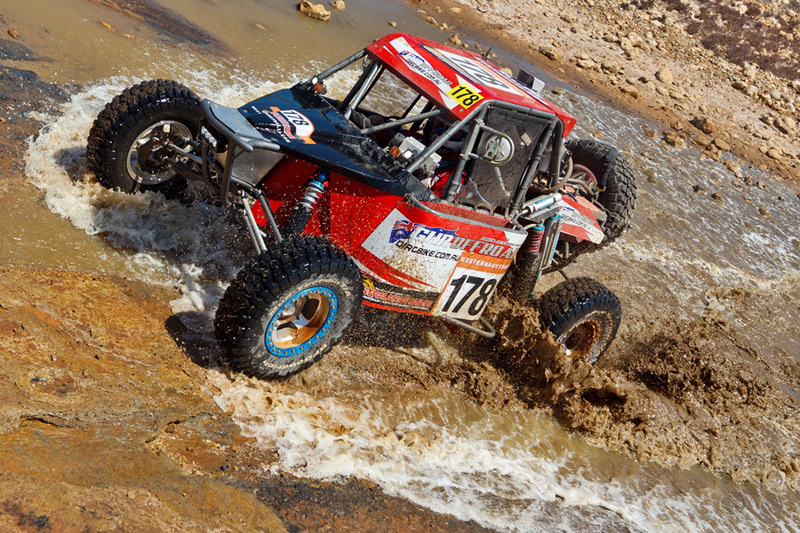 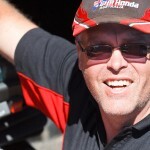 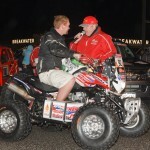 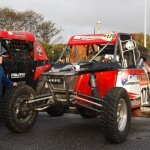 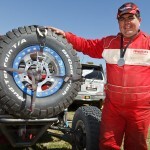 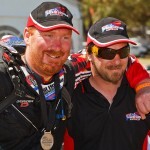 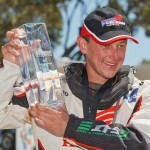 2011 Safari title holder Todd Smith also finished but was way down the order in last place due to time penalties. 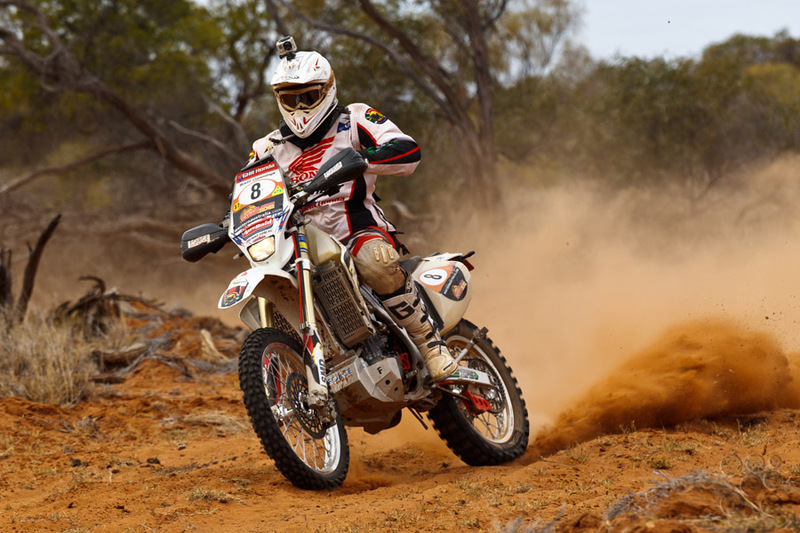 In the quad division, Paul Smith had stamped his authority on the race early on and finished on his Honda TRX700XX more than an hour ahead of his nearest rival. 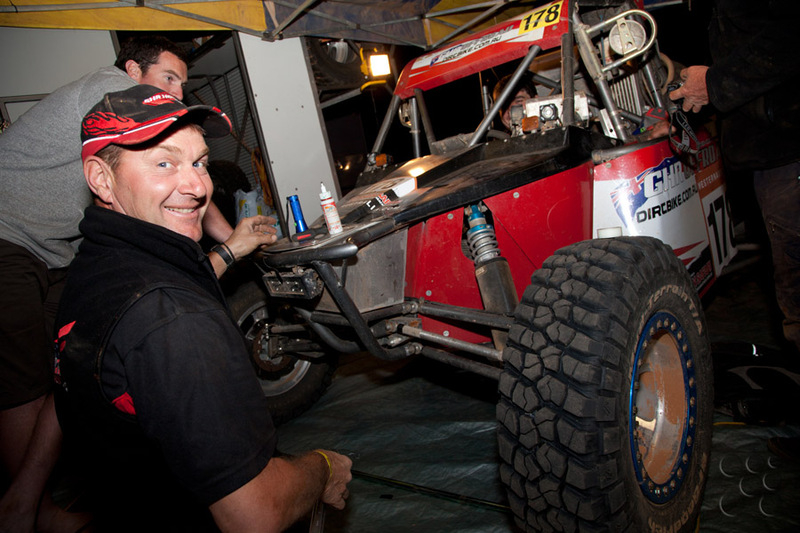 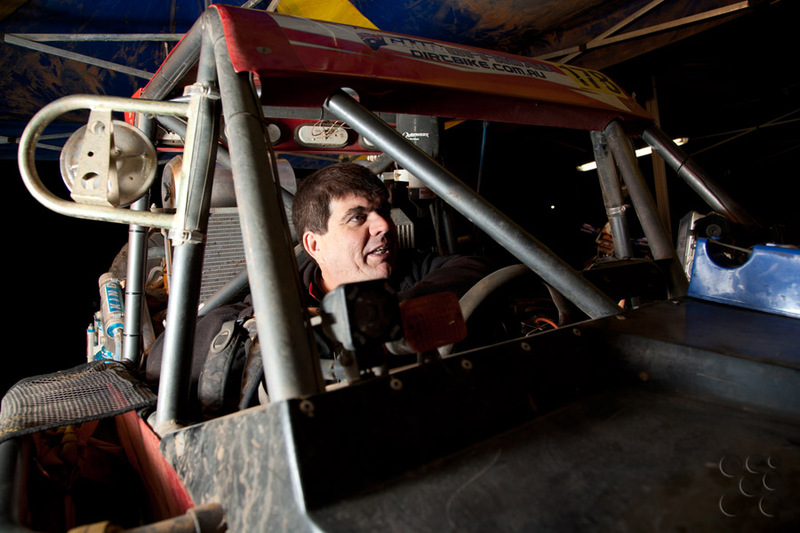 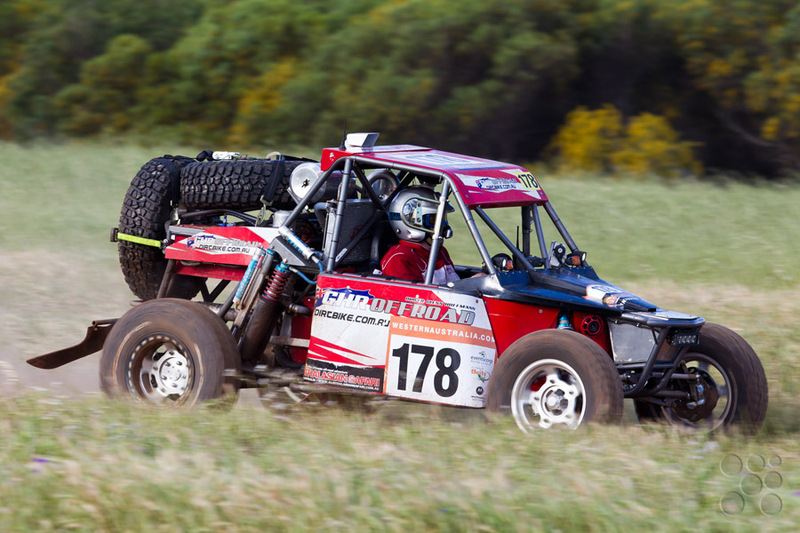 Team owner Glenn Hoffmann brought his prototype buggy home in 17th place amongst the auto division in the vehicle’s Safari debut. 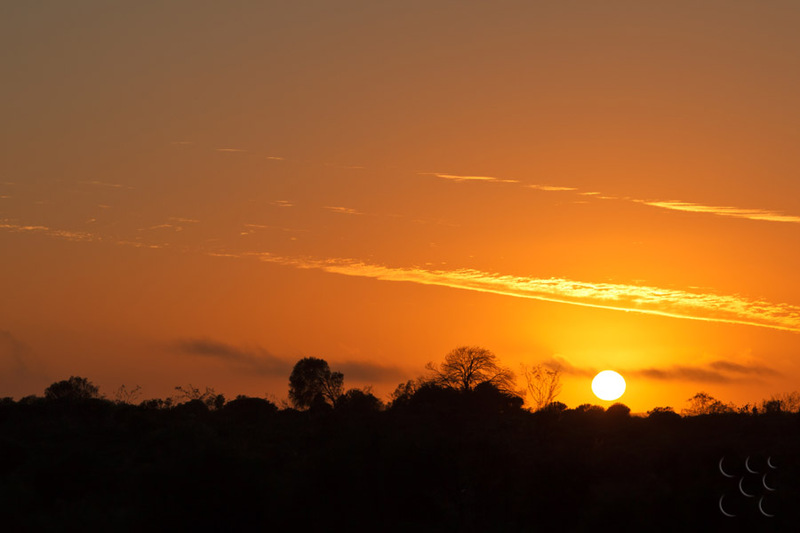 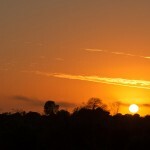 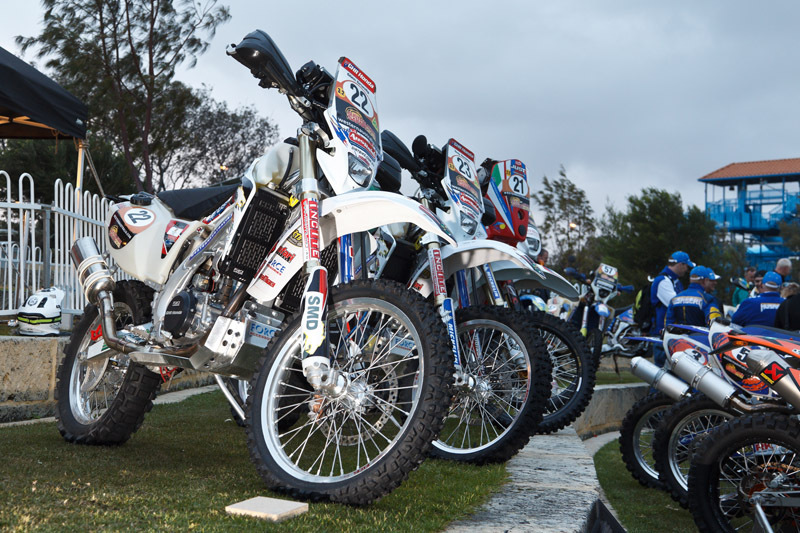 Tonight the riders all get to relax and reflect on another year at Safari. 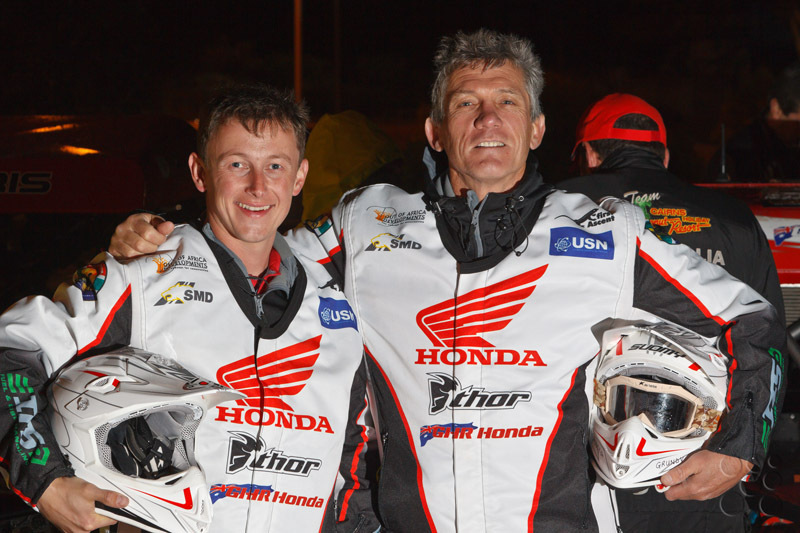 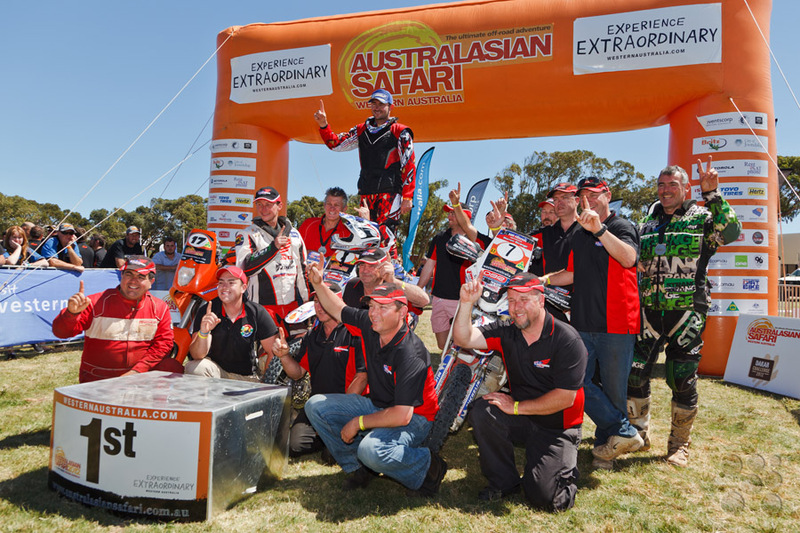 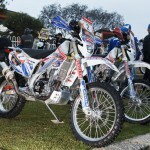 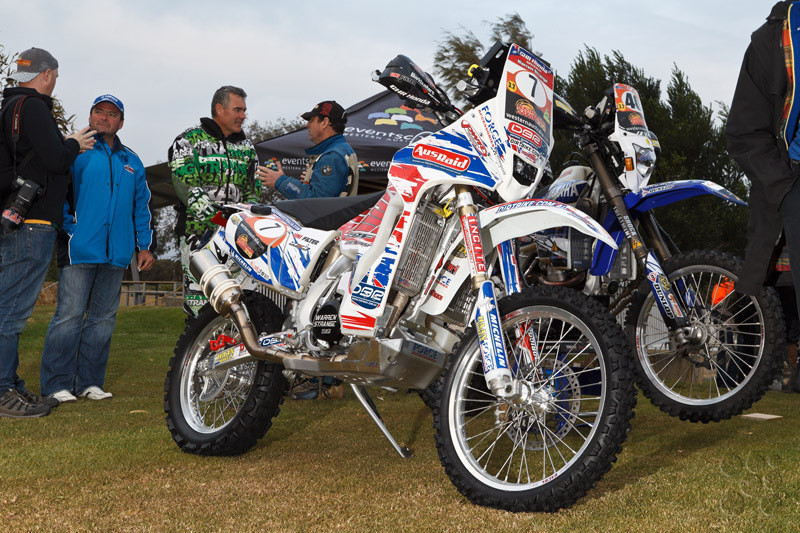 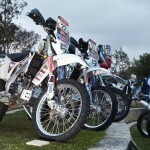 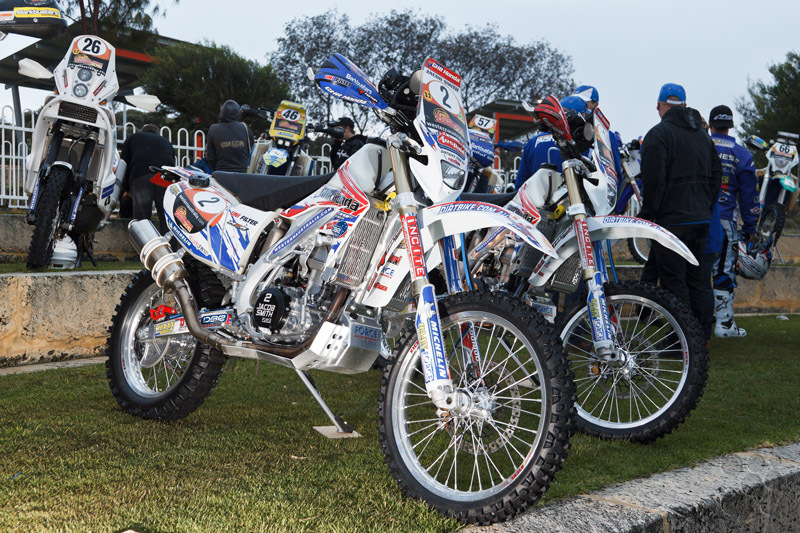 It’s been a very successful event for the team and is the fifth time in six Safaris that Honda bikes have won the event. 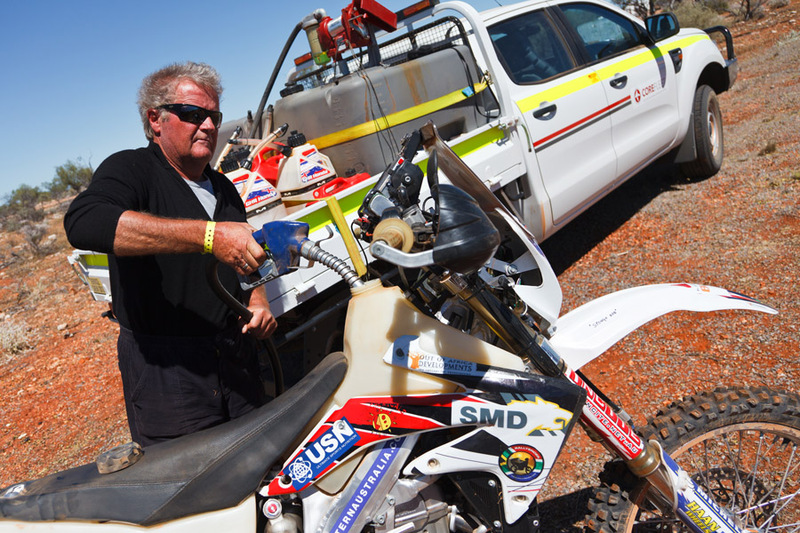 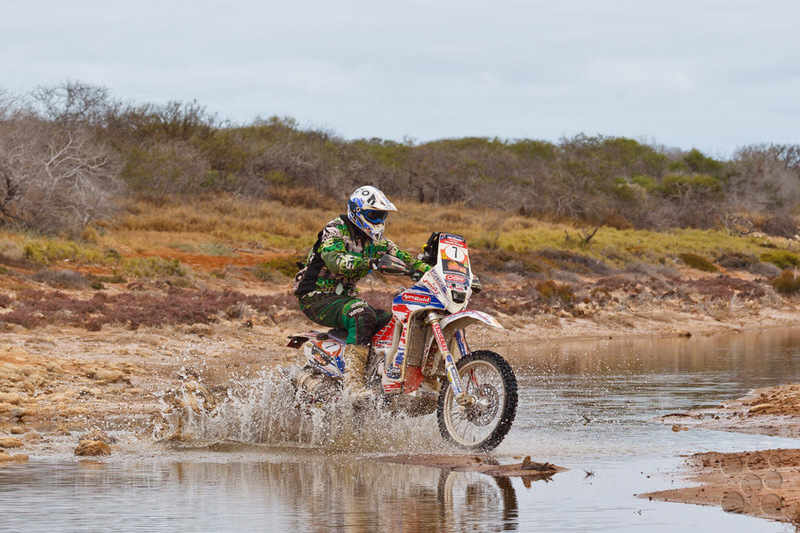 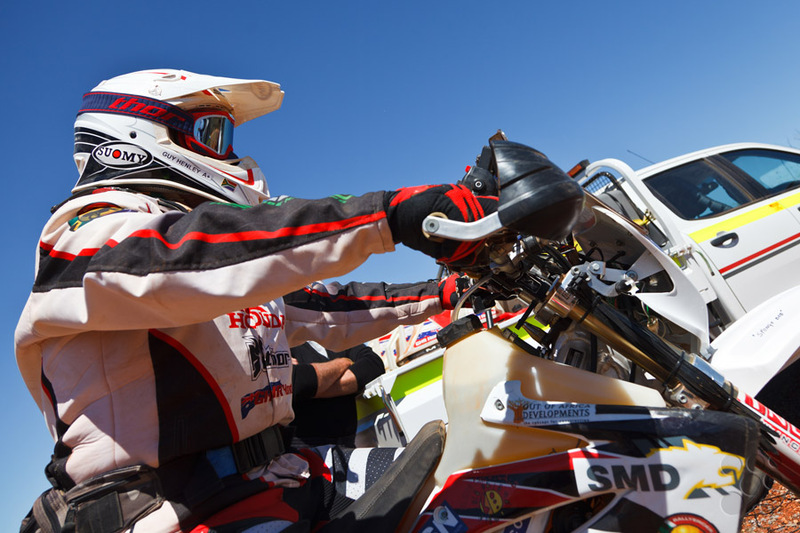 At the end of Leg 6 – the penultimate day of the Australasian Safari and the last long day of racing – GHR Honda’s Jacob Smith is closing in on a second Safari victory. 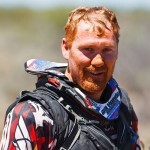 For the last two days Smith has been riding a defensive race, with team mate Warren Strange less than 30 minutes behind. 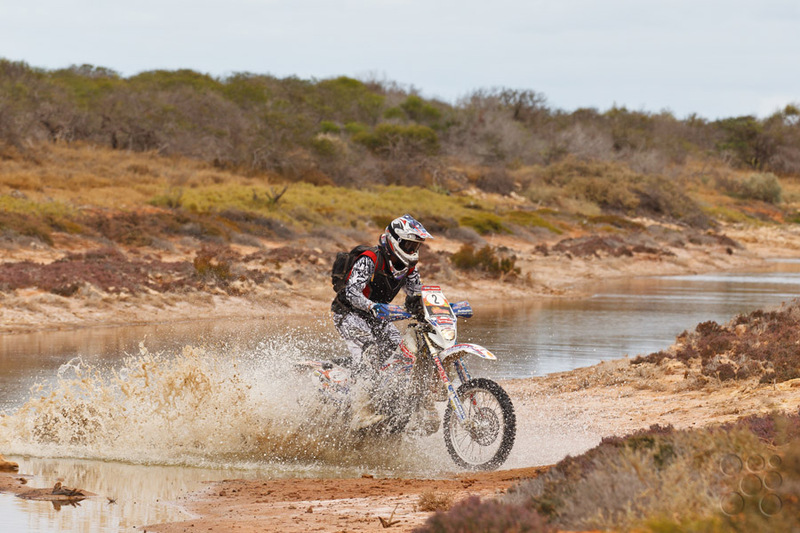 The 429km course retraced some ground covered in Leg 2 but this time in reverse, and the riders found markedly changed road conditions since their first passage on Monday. 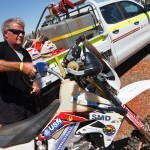 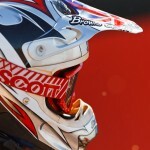 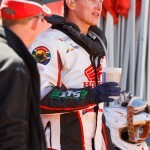 American rider Mike Johnson is reportedly doing well after his crash yesterday. 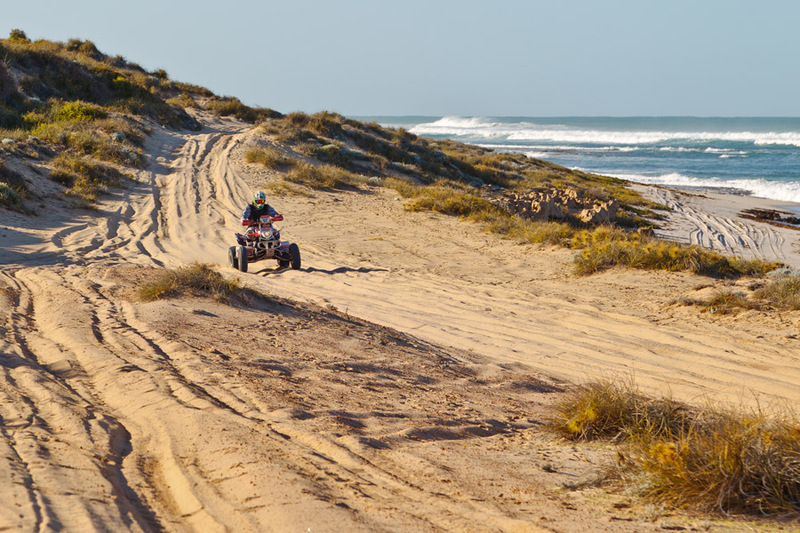 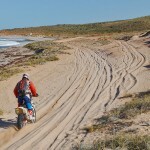 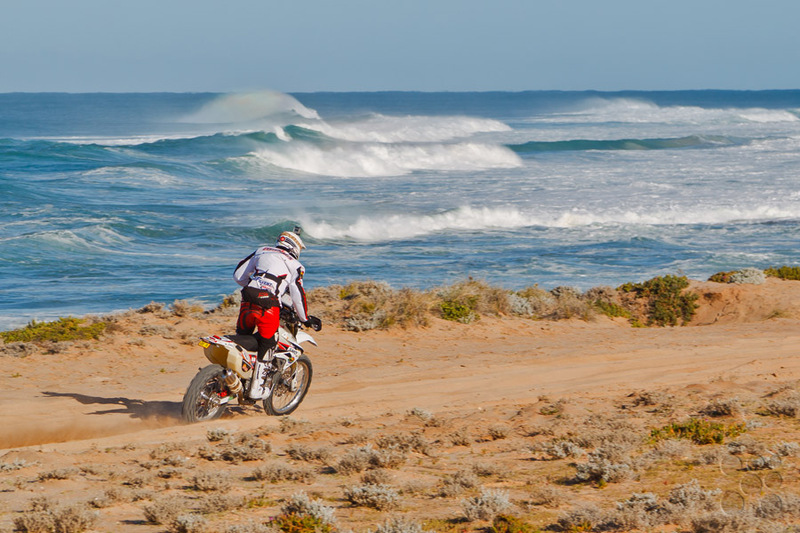 Leg 7 will bring the riders home to the finish line in Geraldton via two short beach sprints once they leave Kalbarri. 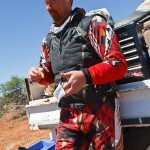 Leg 5 of the 2012 Australasian Safari consisted of a looping anticlockwise circumnavigation of the Bidgemia Station to the north east of the overnight bivouac at Gascoyne Junction. 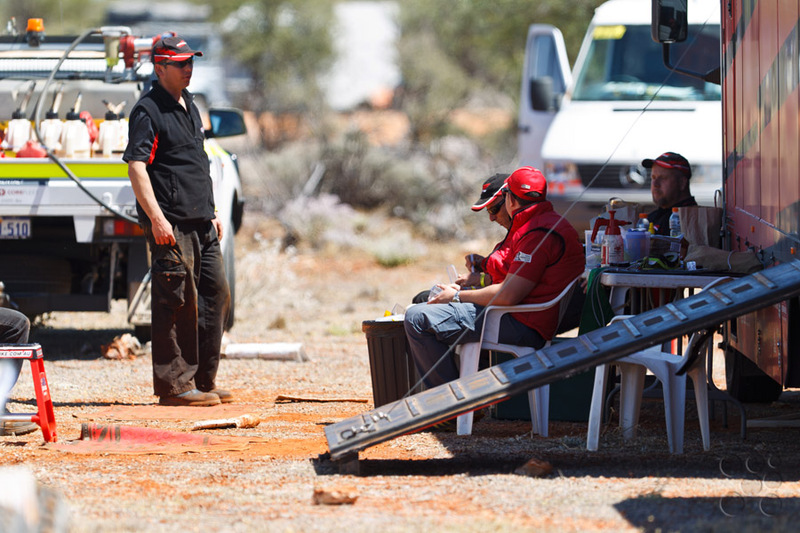 SS11 Gascoyne’s 147.25km opened with fast rally roads before switching to rougher and less defined station tracks. 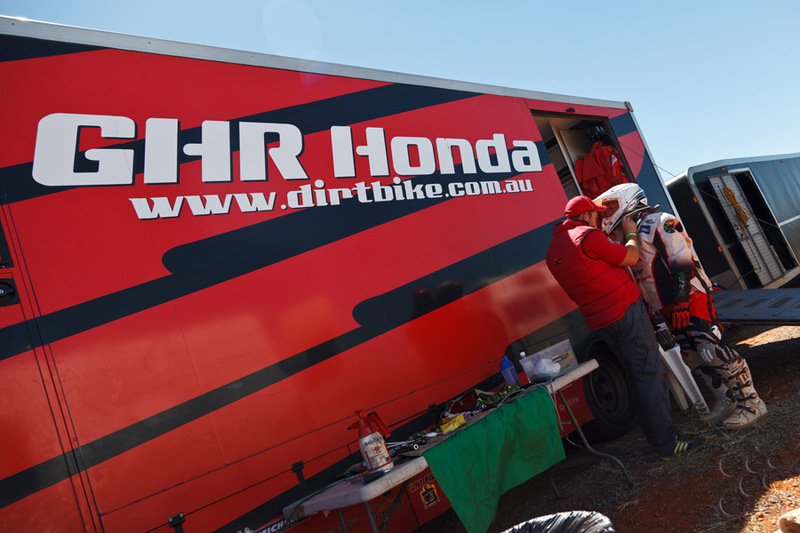 GHR Honda #10 rider Michael Johnson (USA) crashed out and was sadly forced out of the event just as he was finding his stride. 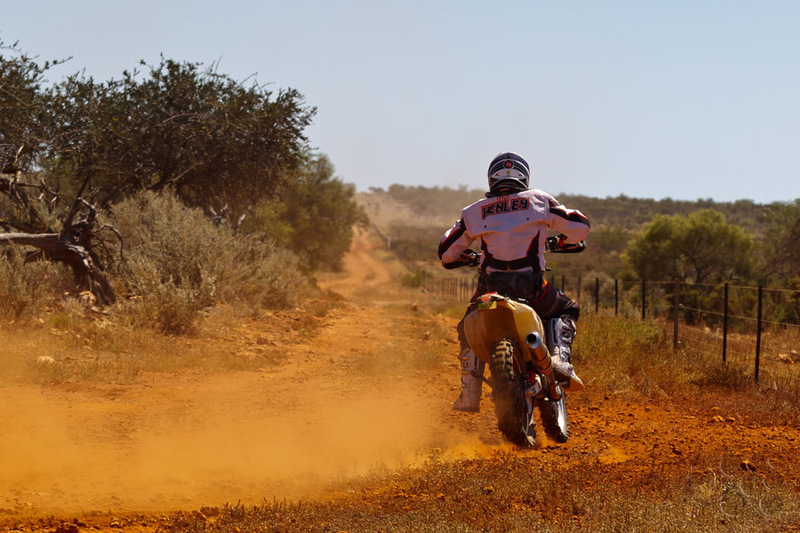 SS12 Bidgemia was a much longer 301.39km and scattered the field as riders contended with now disused tracks littered with hidden rocks. 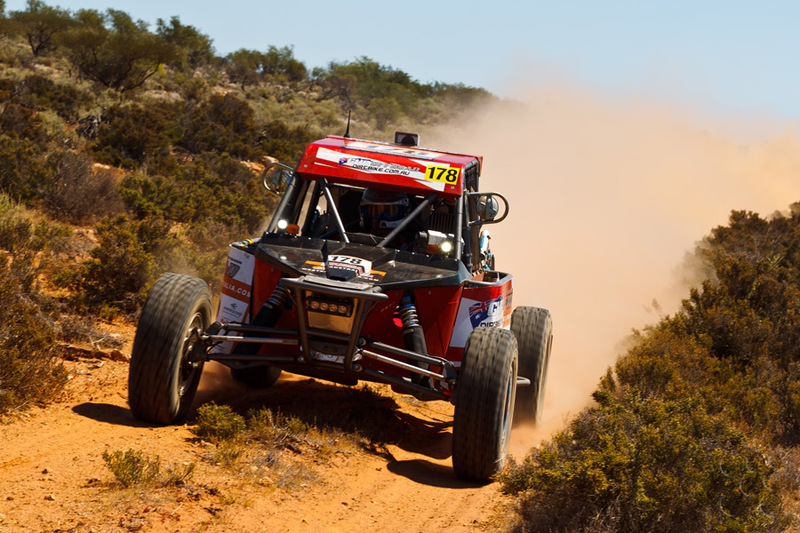 By day’s end, GHR frontrunner Jacob Smith’s lead stood at over 25 minutes despite his conservative approach as the race end has come in site. 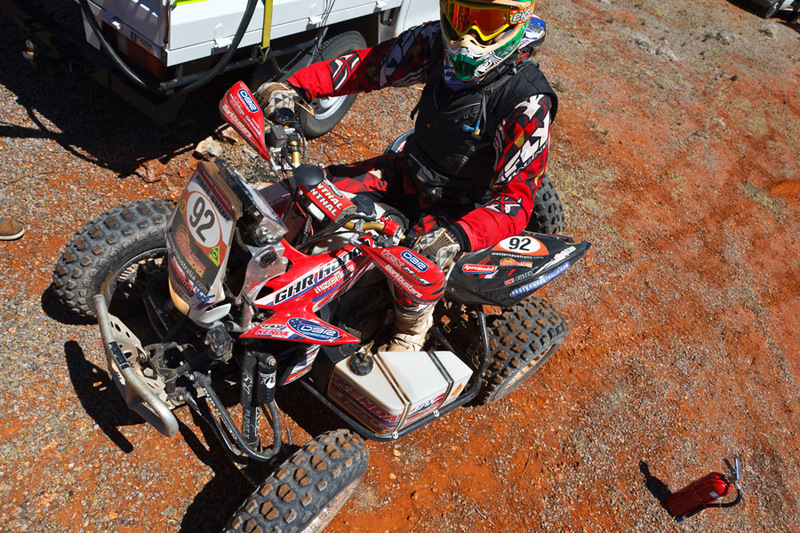 GHR quad rider Paul Smith remains comfortably in front of the quad field even after becoming lost and riding without his front brakes for a large portion of the day. 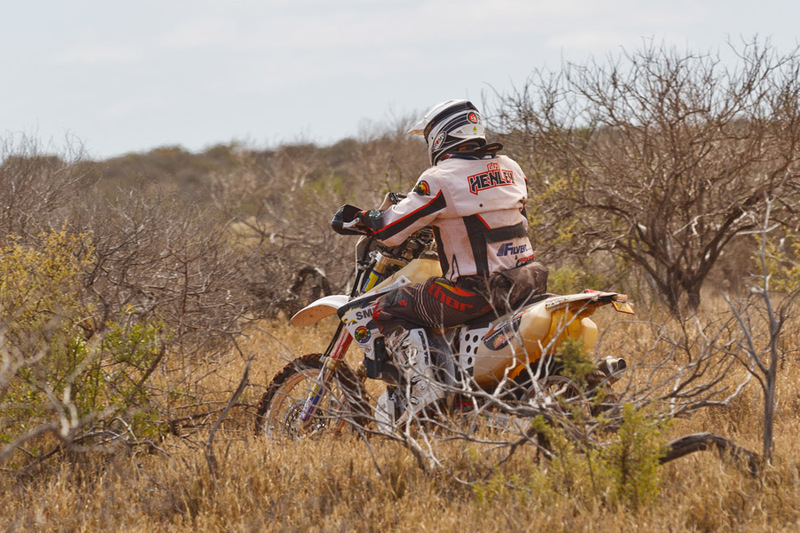 South African national #8 Brett Cummings had a solid day and recovered from a navigation error to assume both the lead of the Dakar Challenge for this year and 5th place overall. 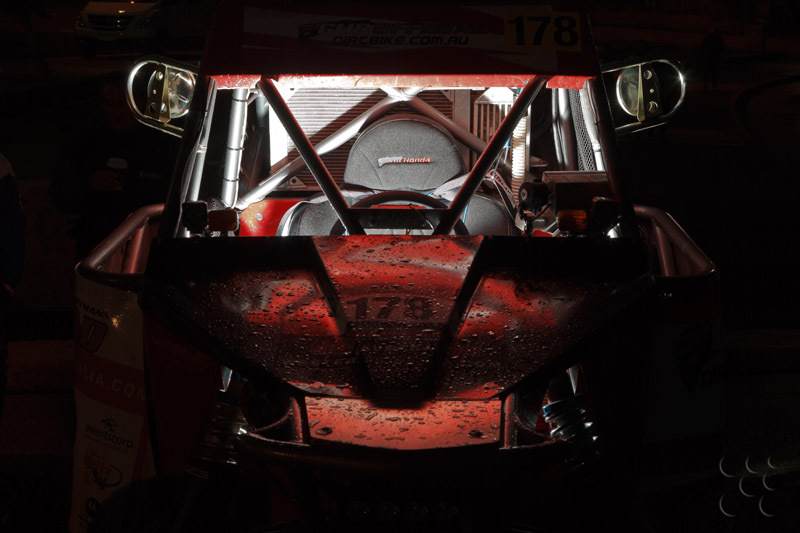 Brett Cummings: “It was a long day again today. 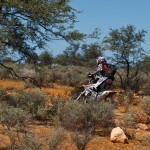 The terrain was very similar to Namibia and Botswana back home. 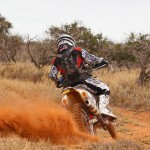 I thoroughly enjoyed it and had no issues. 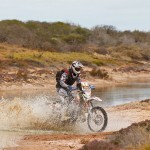 In the second stage I got lost for about 10 minutes at about the 45km mark. 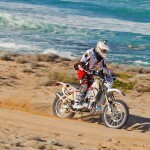 Once I worked it out I got on it really hard and passed a few bikes. 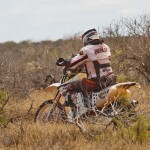 I came across one of the Dutch riders who had crashed heavily and decided to back off from there. 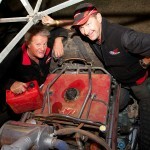 Towards the end of the stage I saw Vern Strange broken down and that convinced me to take it even easier. 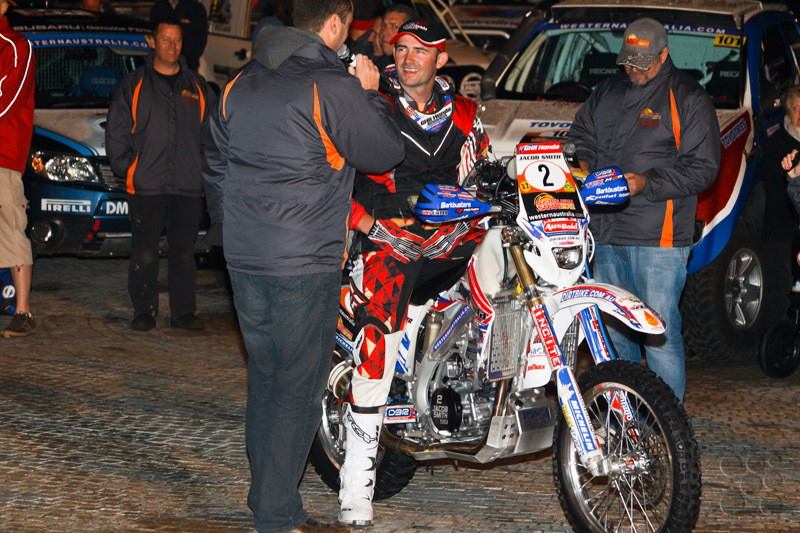 There are now about 50 minutes between myself and 6th outright, and importantly I am now leading the Dakar Challenge. 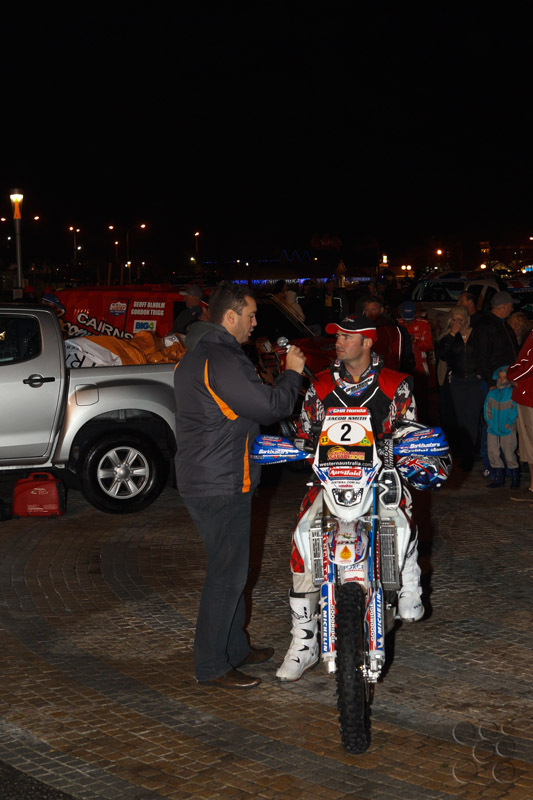 I’m comfortable taking whatever I can as an outright position, but I am focussed on taking out the Dakar Challenge. 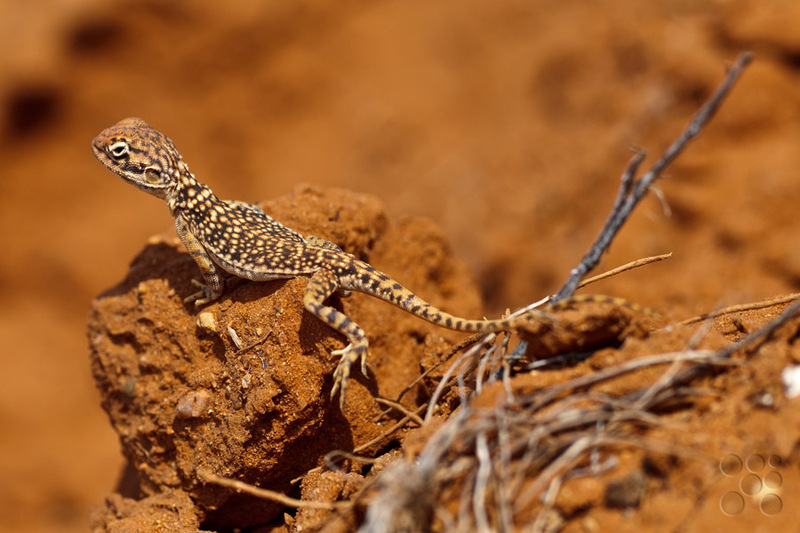 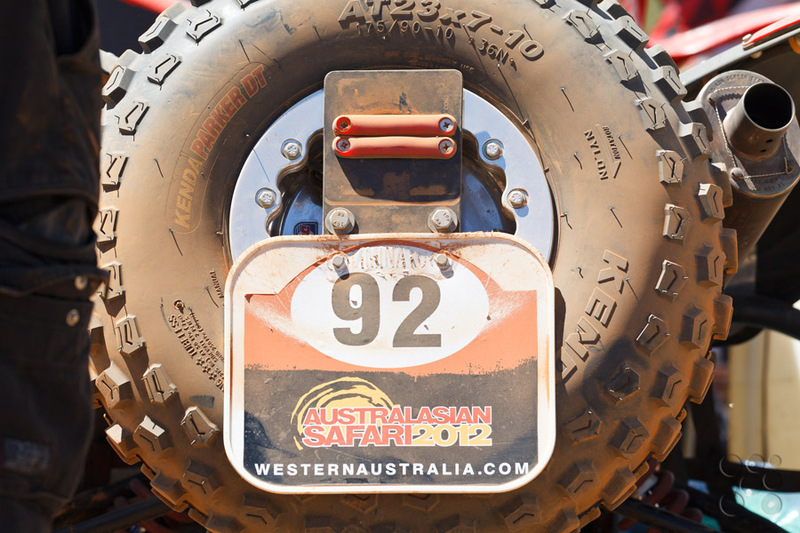 Summary of Leg 5 from the Australasian Safari website. 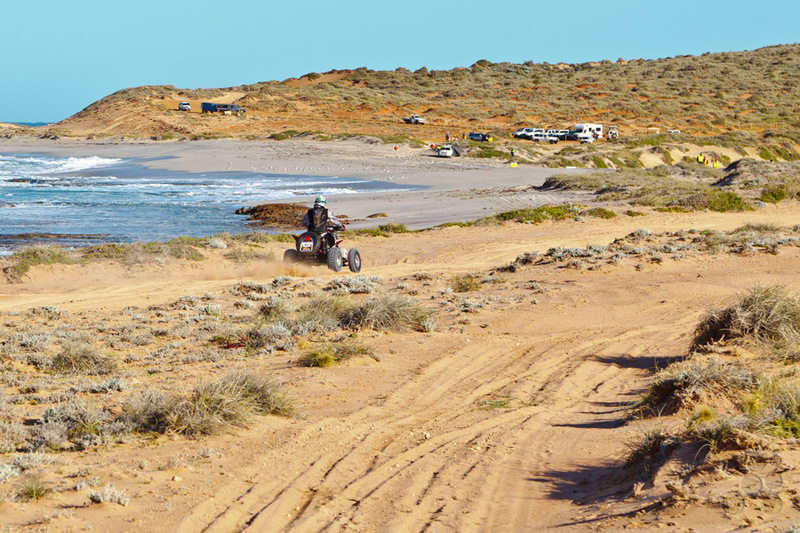 After a relatively long rest a sleep in this morning the Safari field left the coast and ventured westwards into the Kennedy Range. Fast paced station tracks made up most of the 155.66km SS9 Cooralya stage. 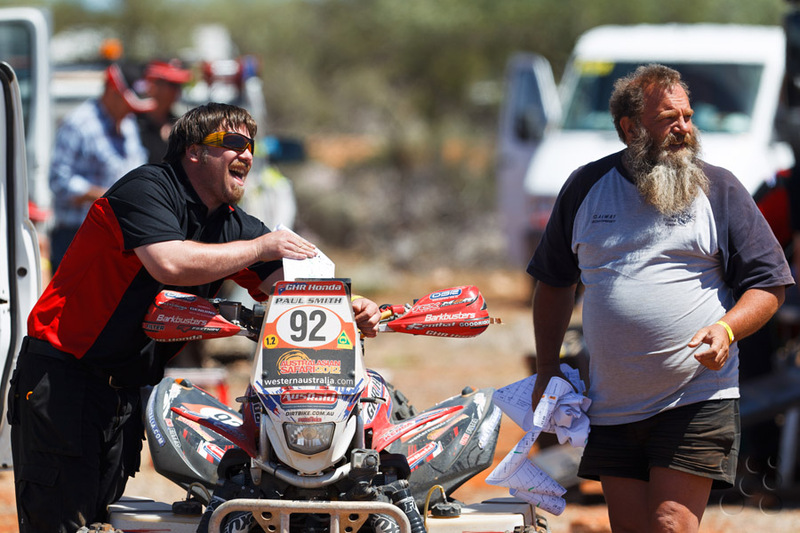 A short transport section took competitors across to the start of the SS10 Kennedy Range and the south westerly run to Gascoyne Junction bivouac. 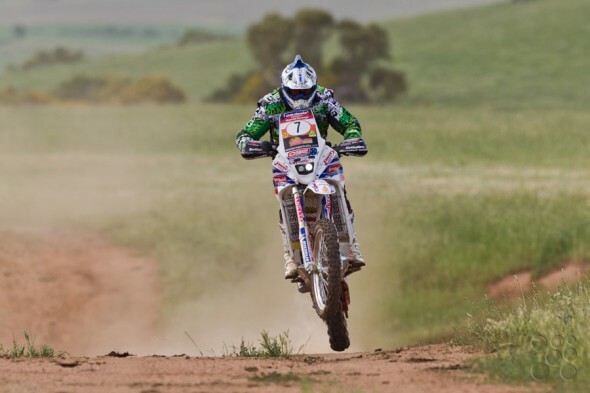 Whereas speed had been the game in the first stage, creek crossings littered with round boulders and sharp rock steps tested riders and machinery throughout SS10. 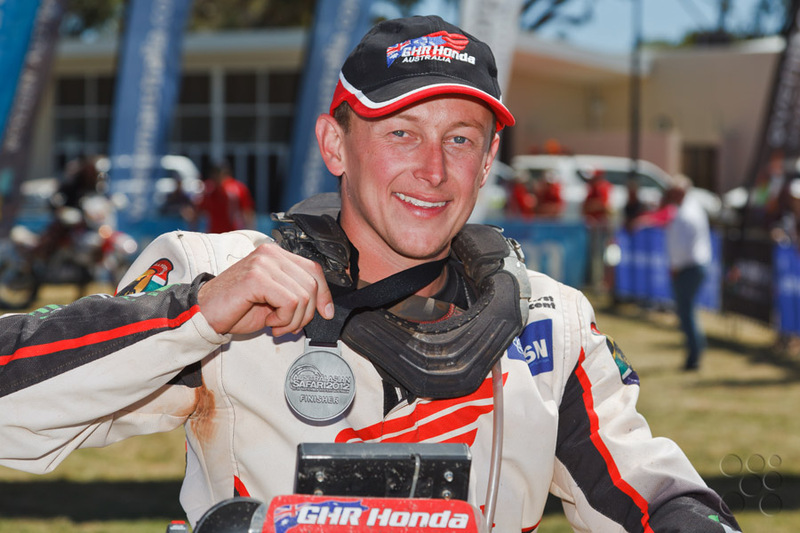 Lead GHR Honda rider Jacob Smith was happy to be second on road this morning after finishing yesterday’s 3 stages 29 seconds behind Yamaha rider Rod Faggotter. 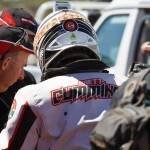 However he rapidly found himself assuming the role of course vanguard after Faggotter stopped with mechanical issues. 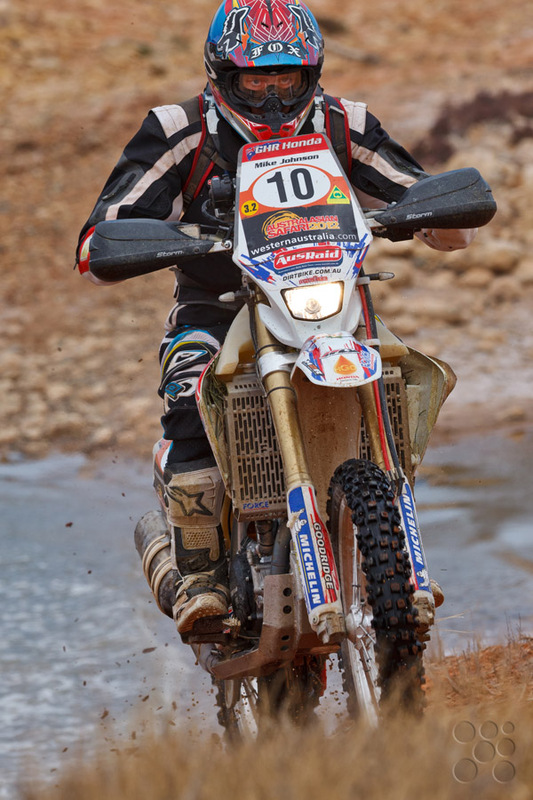 Jacob topped the times for both stages to extend his lead in the race and Warren Strange, initially third on road, also advanced to claim third for the day and second position overall. 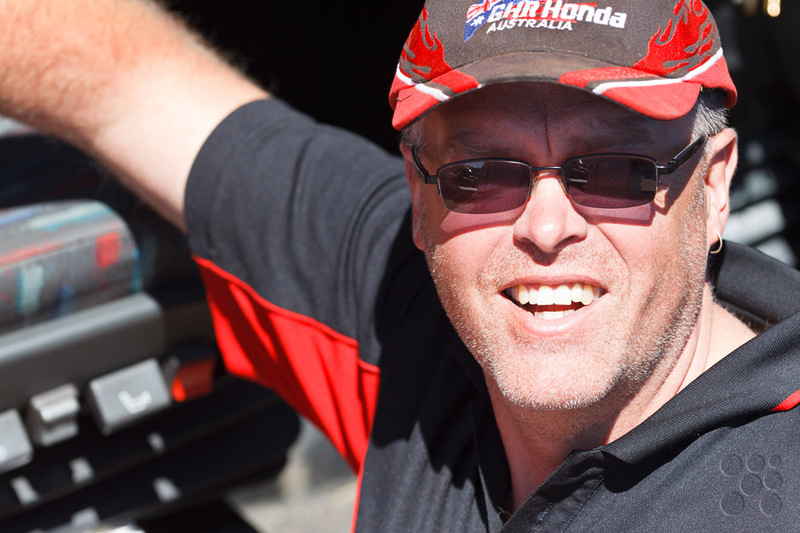 GHR’s Todd Smith rejoined the field today with time penalties, and while he is out of the running for the title this year he logged the second fastest times for both sections. 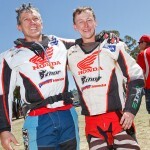 Overseas nationals Brett Cummings (SA), Mike Johnson (USA) and Glen Grundy (SA) all climbed the order and Guy Henley (SA) retained his 12th place in the moto positions. 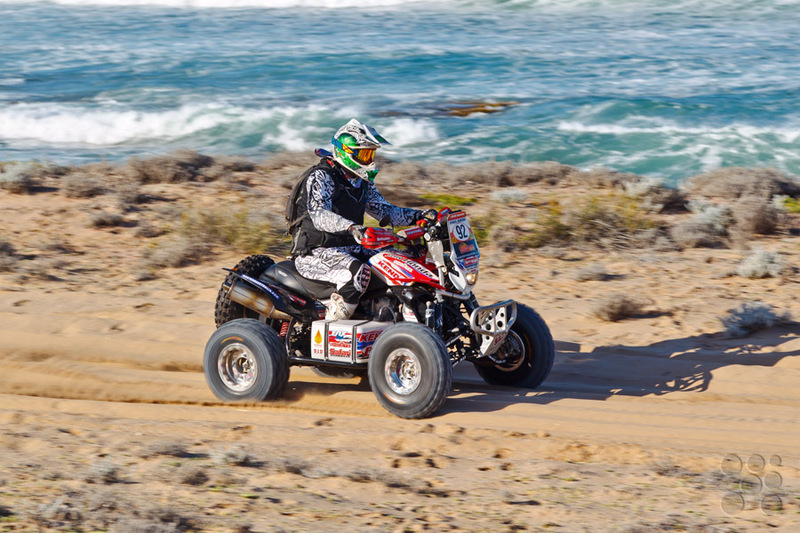 Paul Smith has built buffer of over an hour protecting his lead in the quads having enjoyed a trouble free day on his TRX700XX. 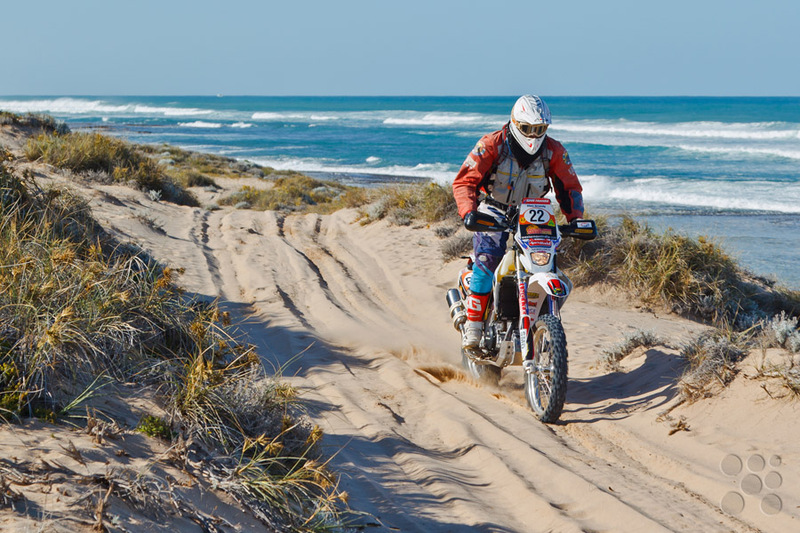 Tomorrow the riders face two stages tomorrow, commencing the day the 147.25km SS11 Gascoyne stage before embarking on the 301.39km SS12 Bidgemia stage. 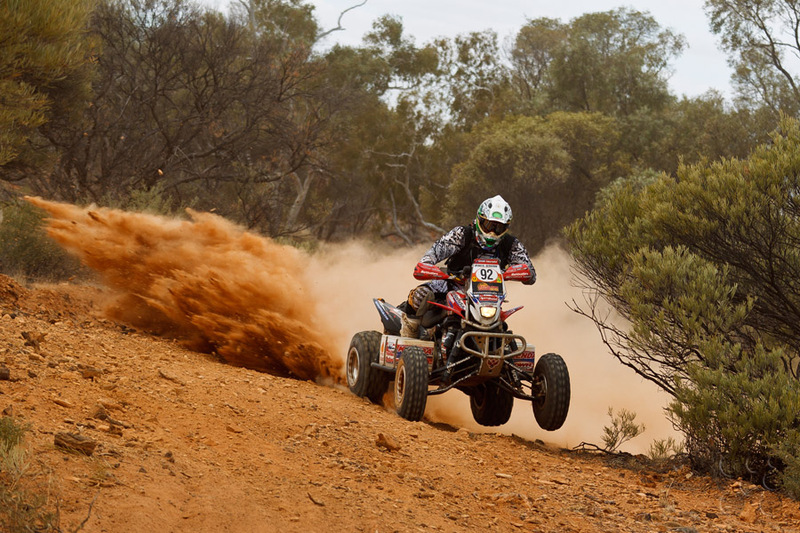 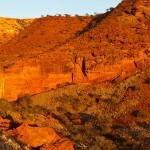 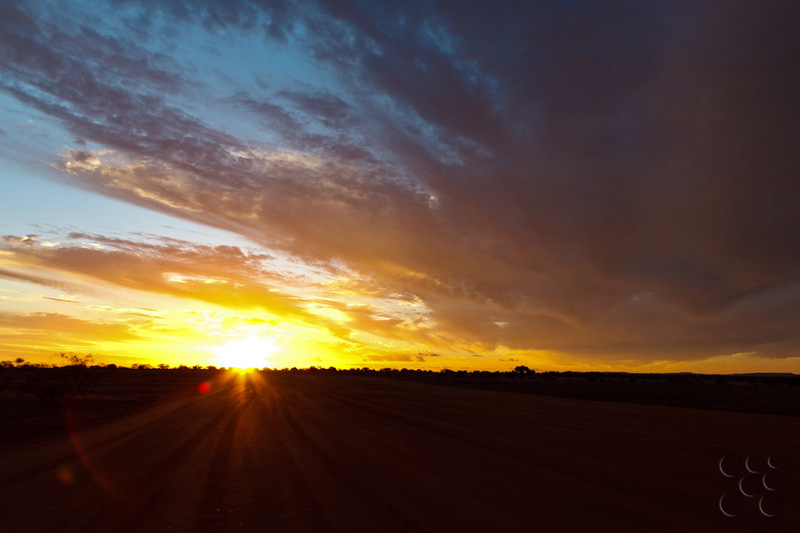 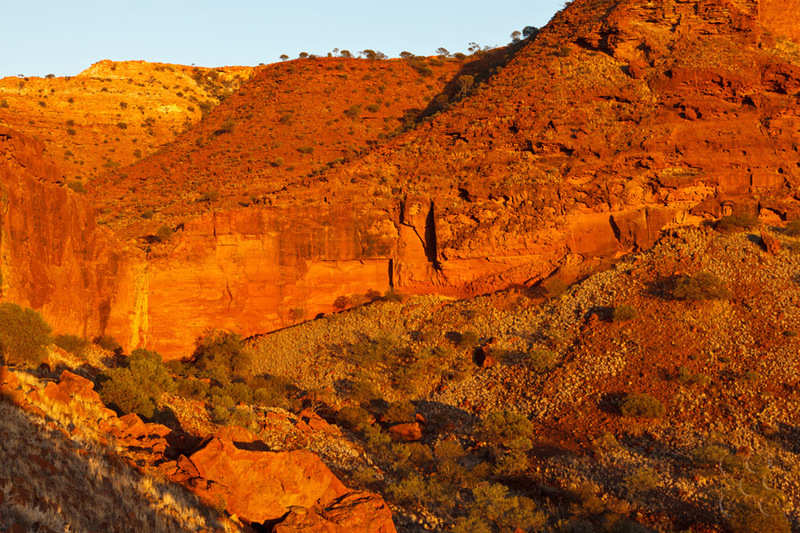 Both sections involve complex navigation, numerous cautions and changes in terrain before they return to Gascoyne Junction for the second time. 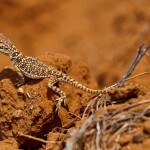 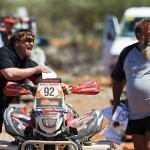 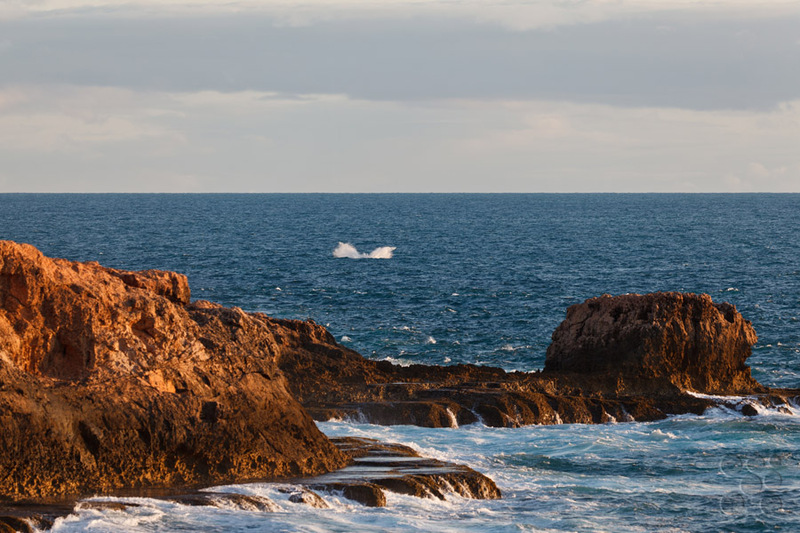 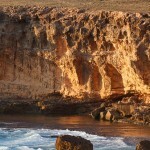 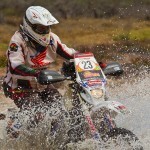 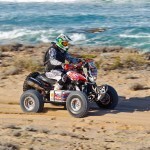 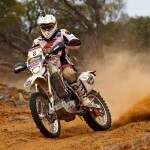 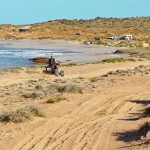 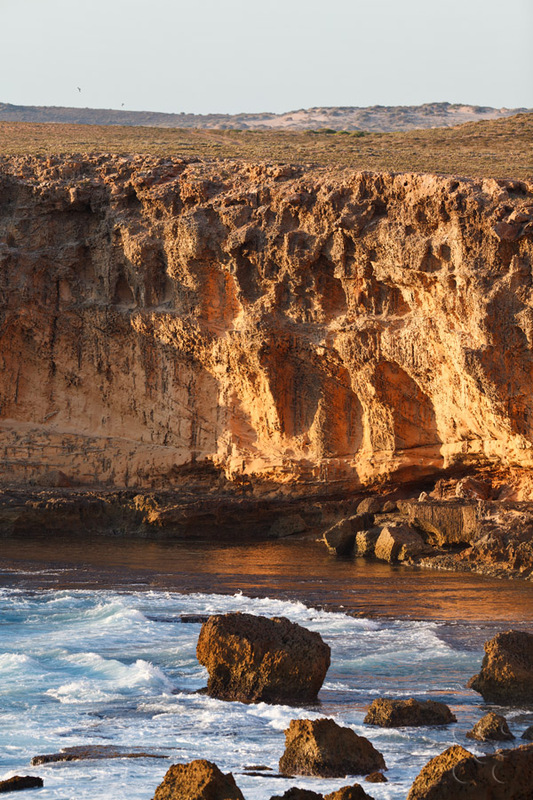 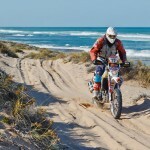 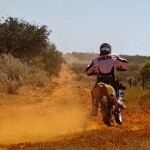 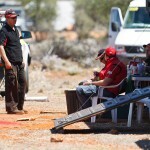 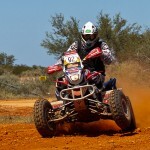 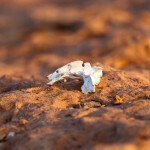 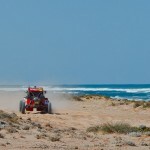 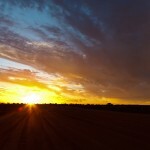 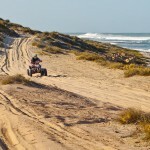 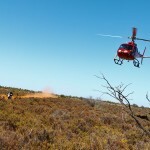 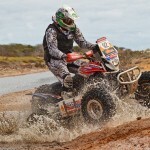 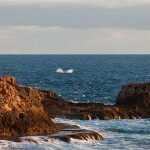 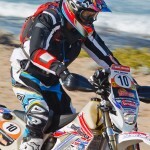 Pictures from Leg 3 SS7 Ningaloo. 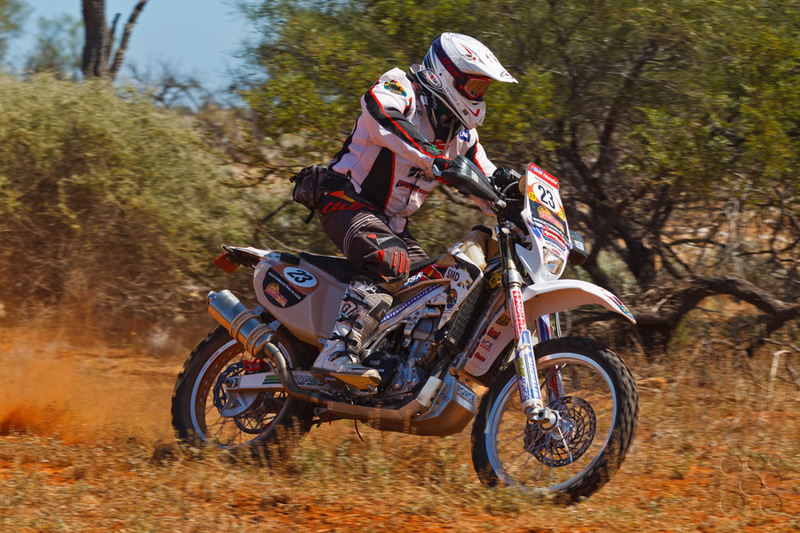 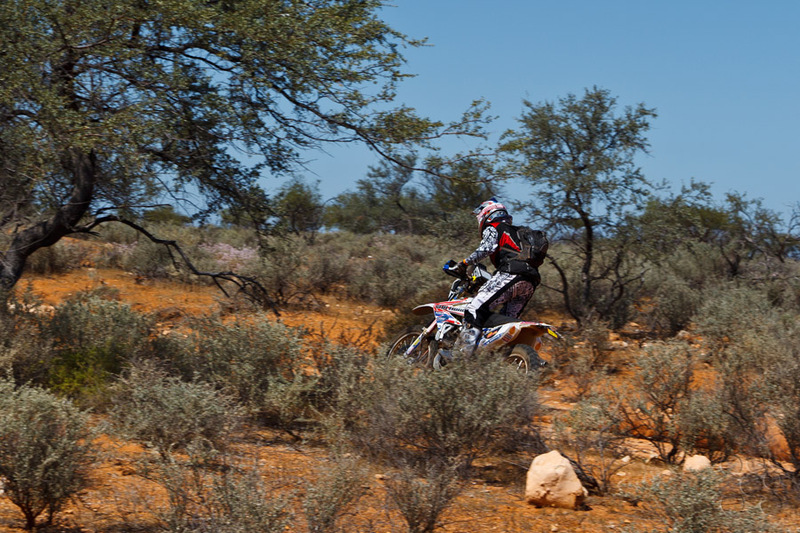 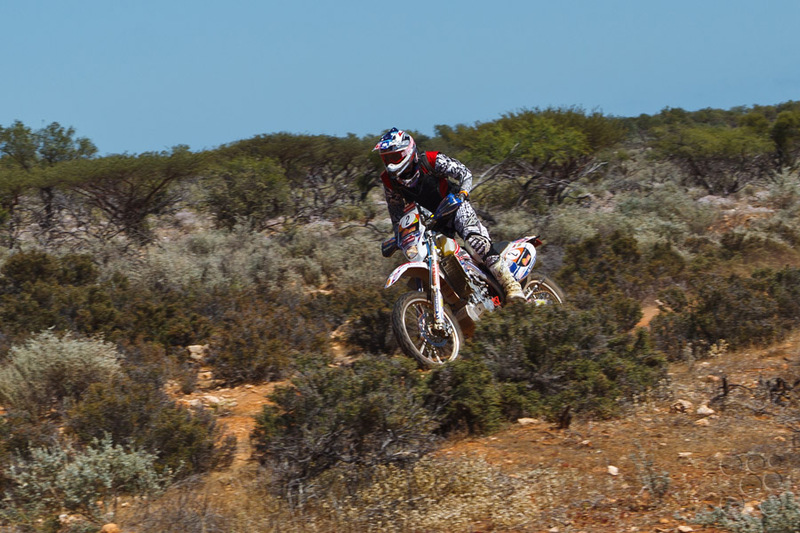 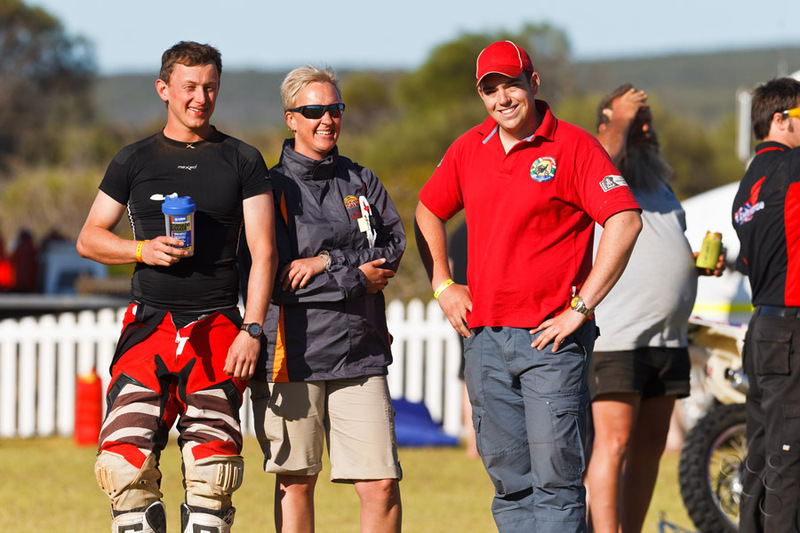 In what proved to be a costly day for 9 Safari competitors, GHR Honda rider Jacob Smith consolidated his Leg 1 position to build a lead of just over 16 minutes over Matthew Fish. 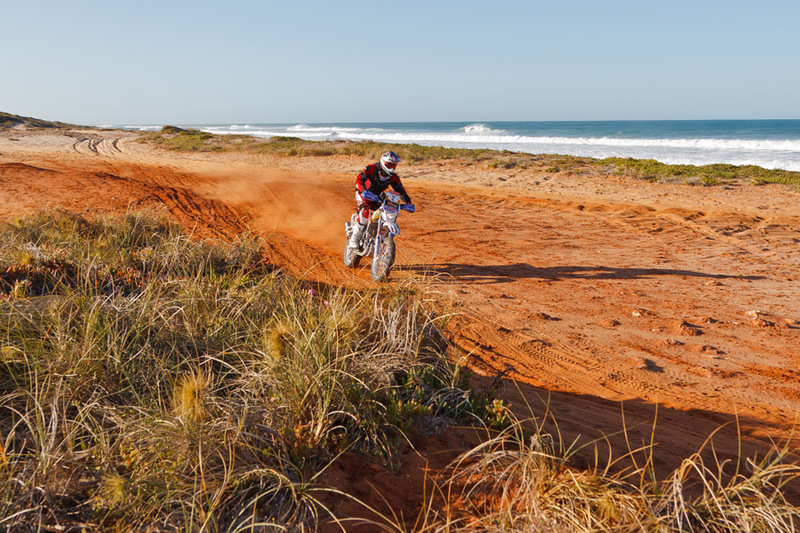 SS4 Kalbarri’s overgrown tracks tore at the riders as they navigated through 230km of coastal farmland to service at Hamelin. 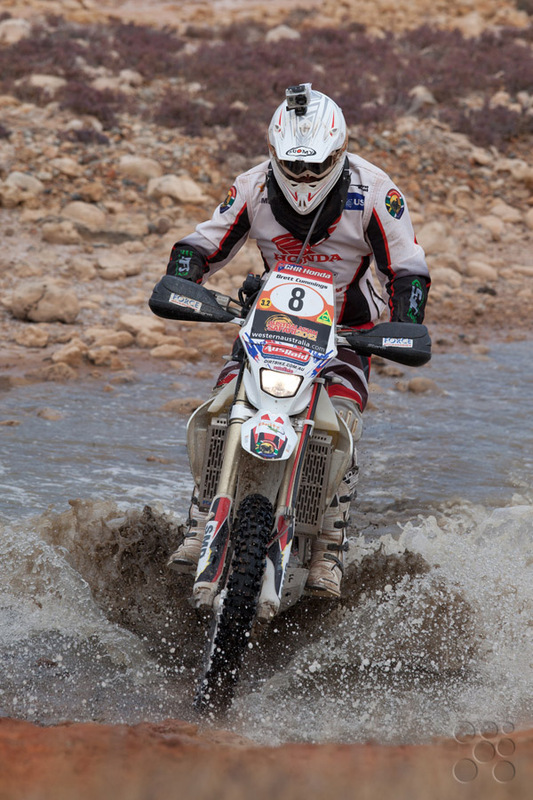 The riders found the 260km SS5 Wooramel River stage less punishing but nonetheless eventful. 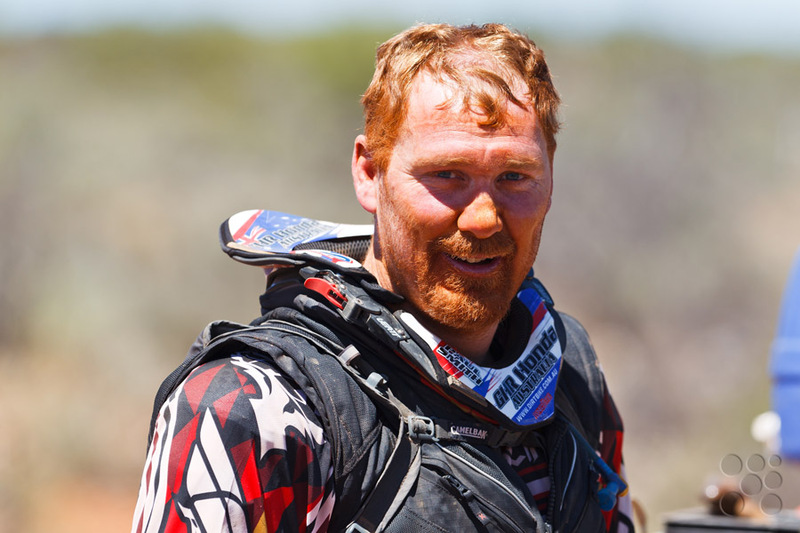 Warren Strange dropped down the order due to navigation and #22 South African rider Glen Grundy had a close encounter with another vehicle at speed. 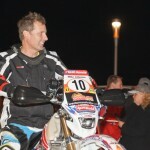 Glenn Hoffmann: “I had a good day today. 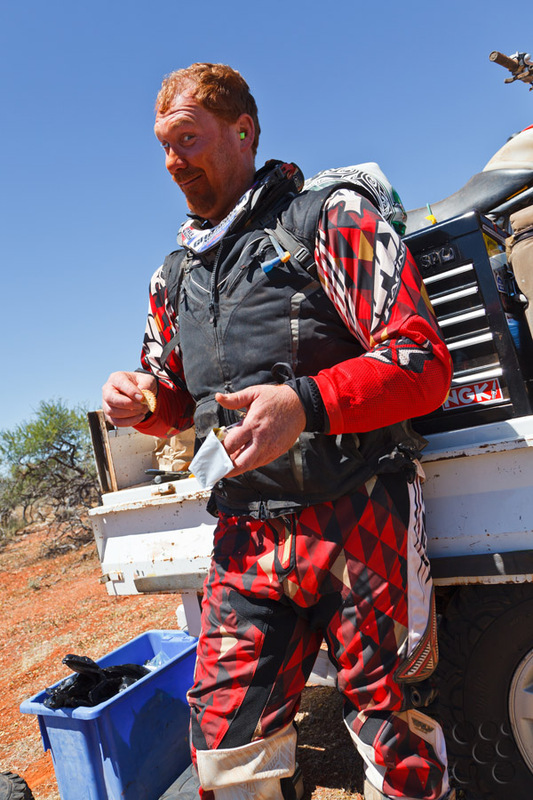 I didn’t want to run out of fuel so I couldn’t drive as hard as I’d like. 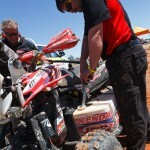 Still, looking at some of the damaged cars by the side of the road I’m fortunate all I had to worry about was fuel. 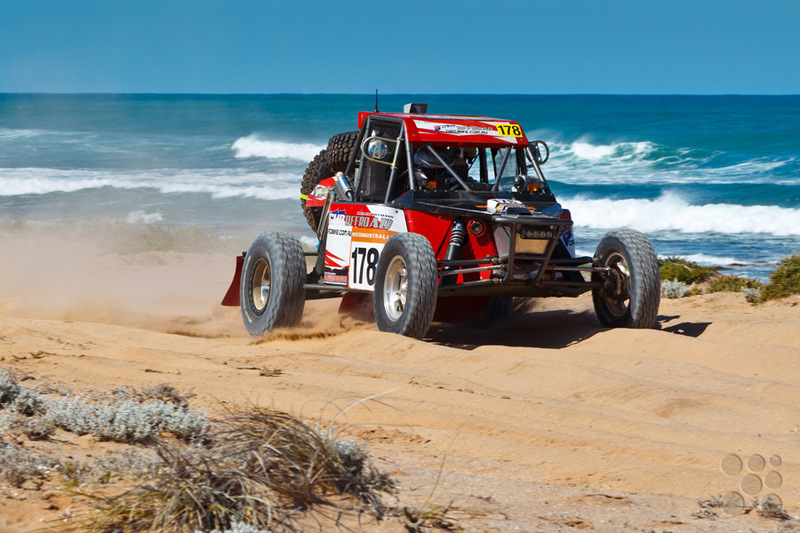 Tomorrow the field are in store for two stages of stunning coastline and sand dunes as they head north for the first splash and dash at Warroora. 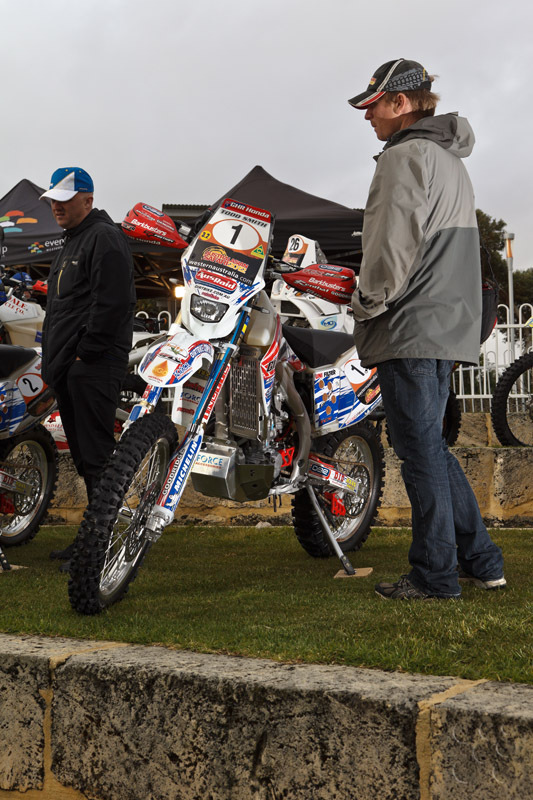 Service crews will meet the vehicles at Minilya before the racing starts again for the 198km Hayley stage. 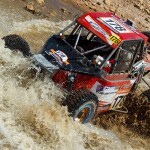 Overall GHR class standings at end of Leg 2. 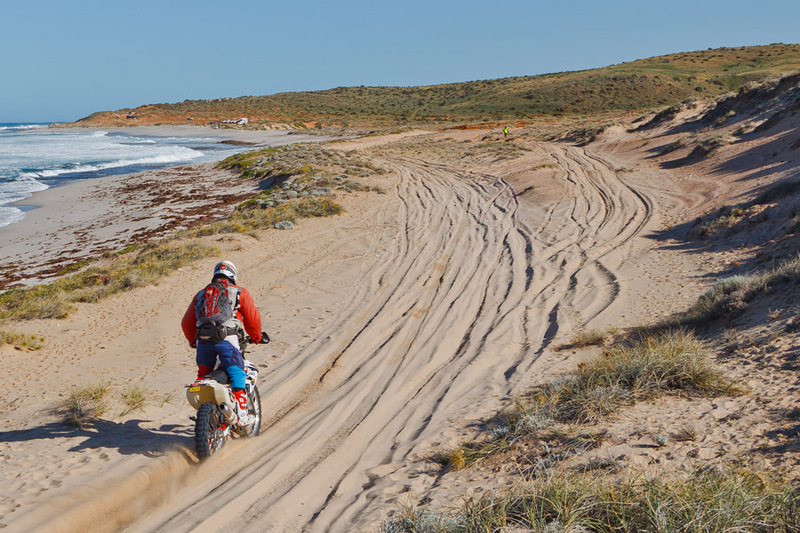 Competitors were treated to a seabreeze and perfect clear skies today throughout the 3 timed sections between Geraldton and Kalbarri. 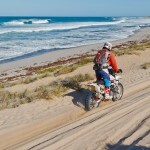 GHR Honda rider Warren Strange was first on road at 6.30am for the SS1 Coronation North 18.21km beach run. 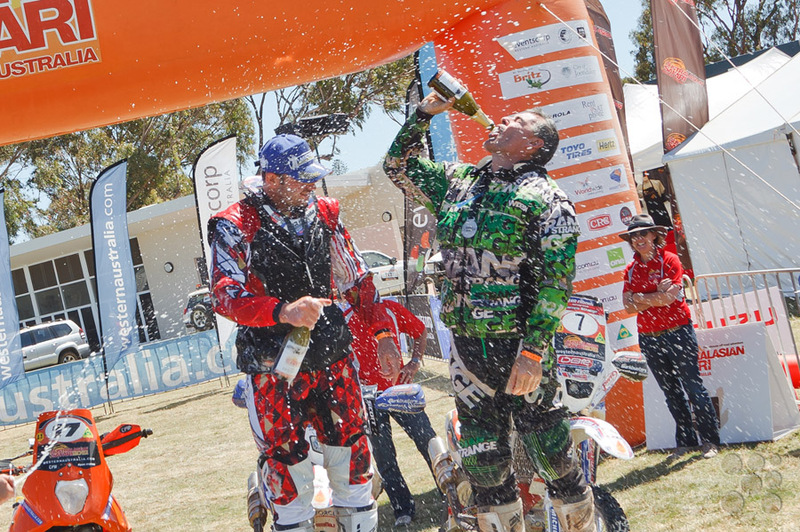 The stage was won by KTM rider Matt Fish, closely followed by GHR riders Todd Smith, brother Jacob and Warren Strange all less than a minute behind. 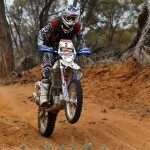 In the quad division GHR rider Paul Smith came in 10 seconds behind Glenn Brown for second place. 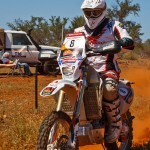 Strange arrived at the end 106.75km of the SS2 Whelarra stage 03.28 ahead of Jacob Smith. 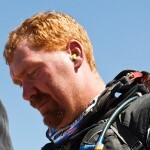 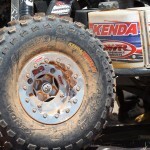 Shane Diener followed in third, but Todd Smith succumbed to engine troubles and DNF’d the stage. 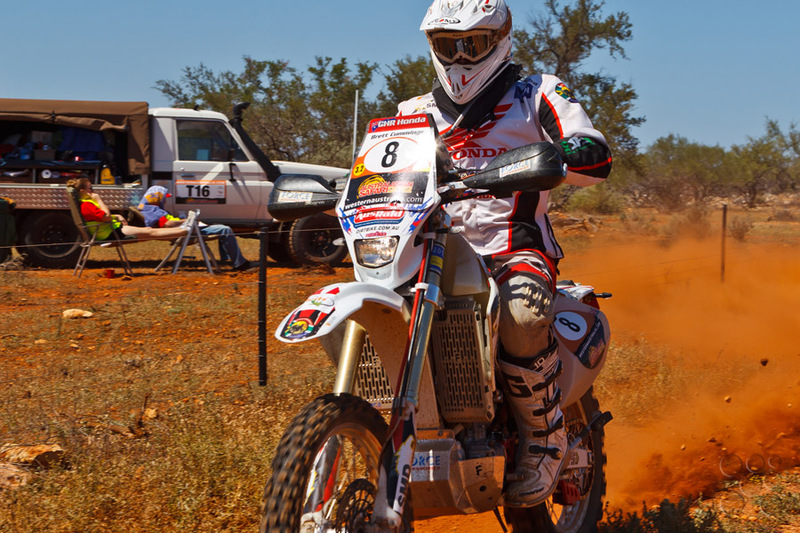 He’s now out of contention for an second Safari win this year and also the Dakar challenge, but he will continue tomorrow and try to help the other team members. 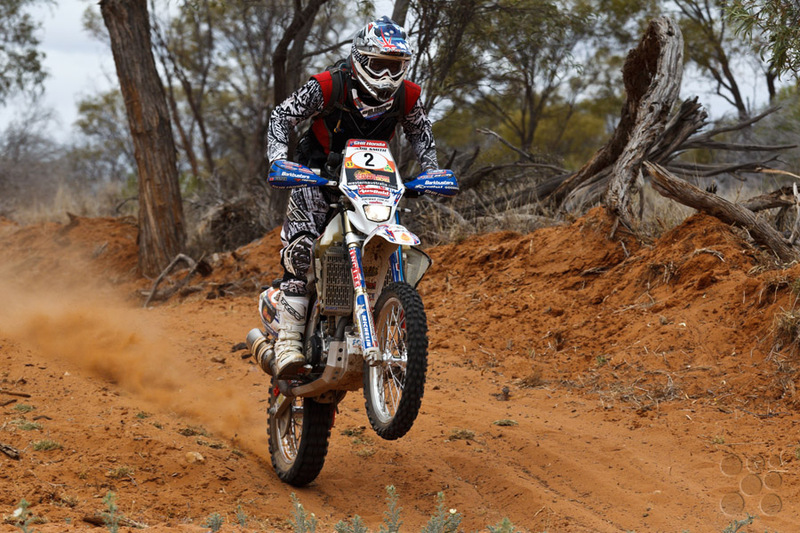 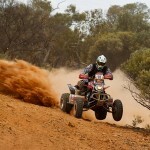 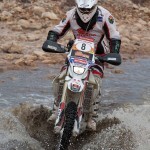 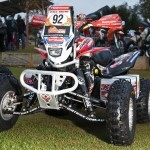 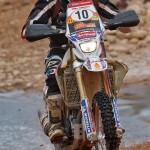 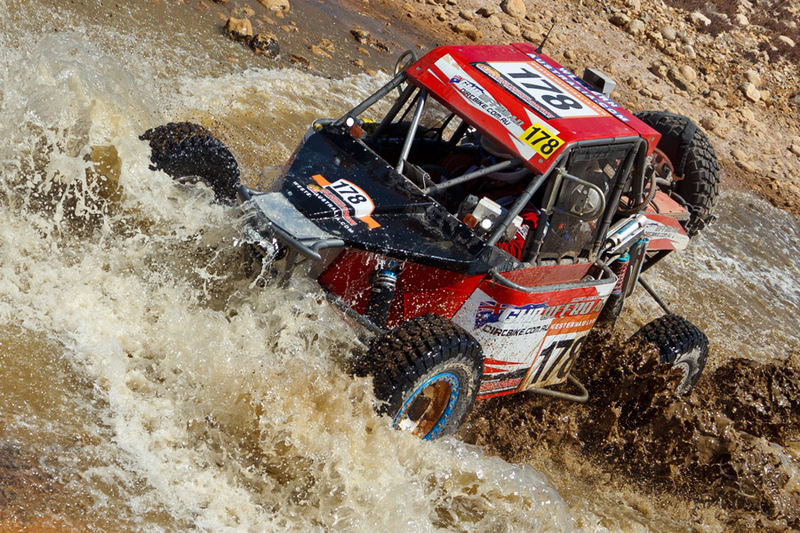 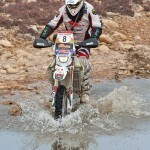 In the quads, Paul Smith dropped to third place due to a puncture. 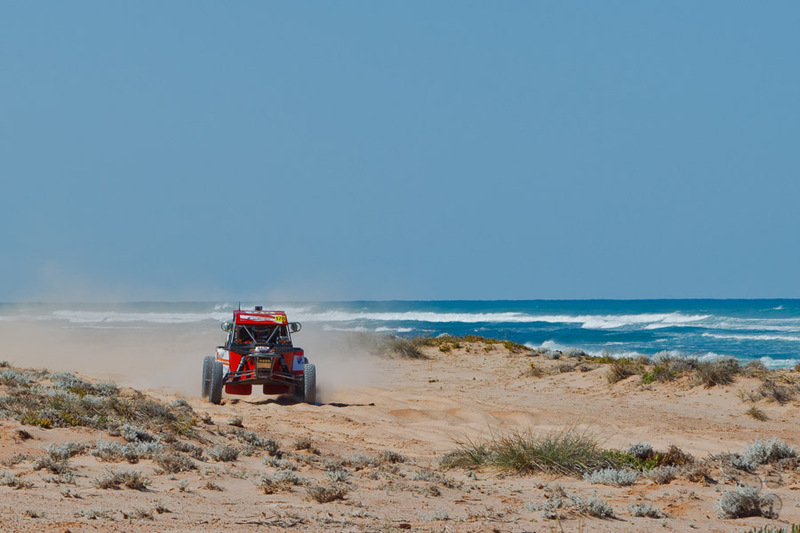 Leaving the coastal sand for some tighter running and trickier navigation, the field turned inland for the 76.36km SS3 Murchison Off Road stage. 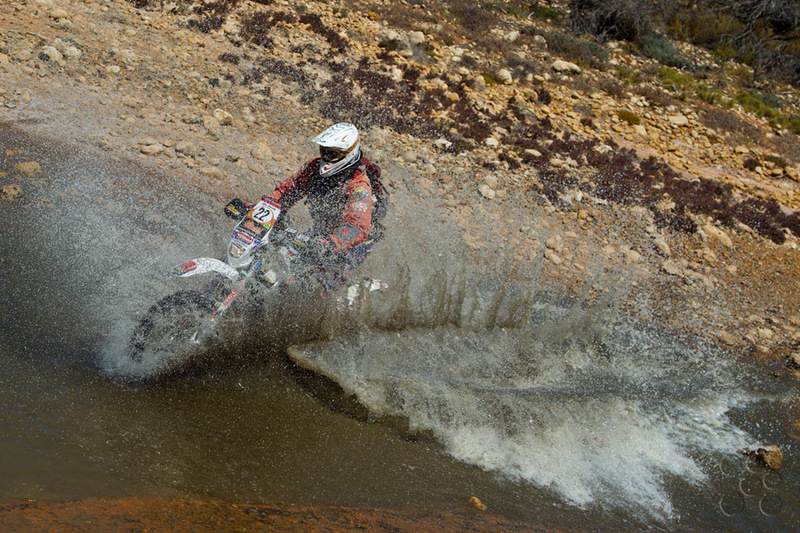 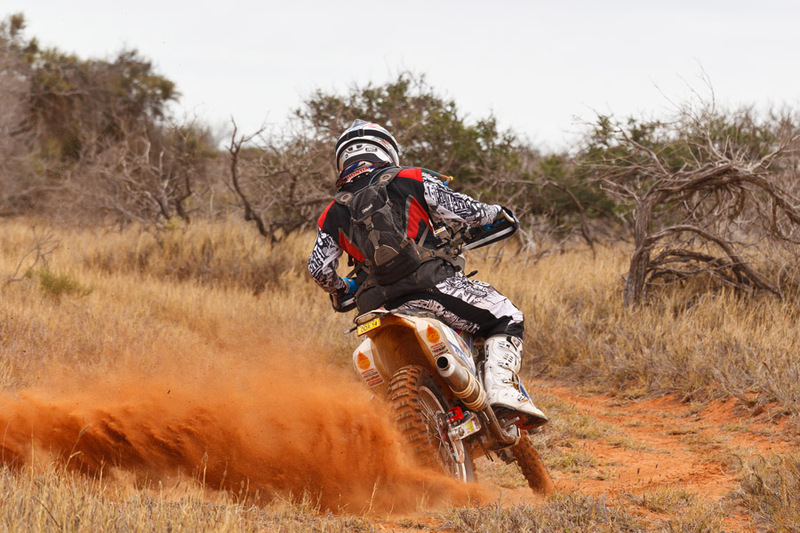 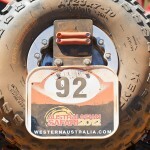 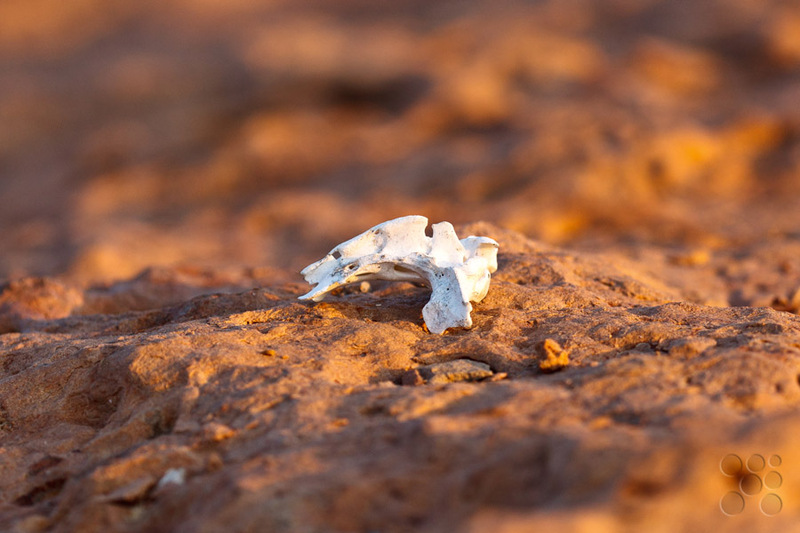 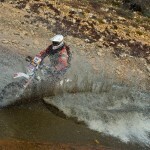 This traced along the dry bed of the Murchison River and challenged riders with ongoing sections of tight corners. 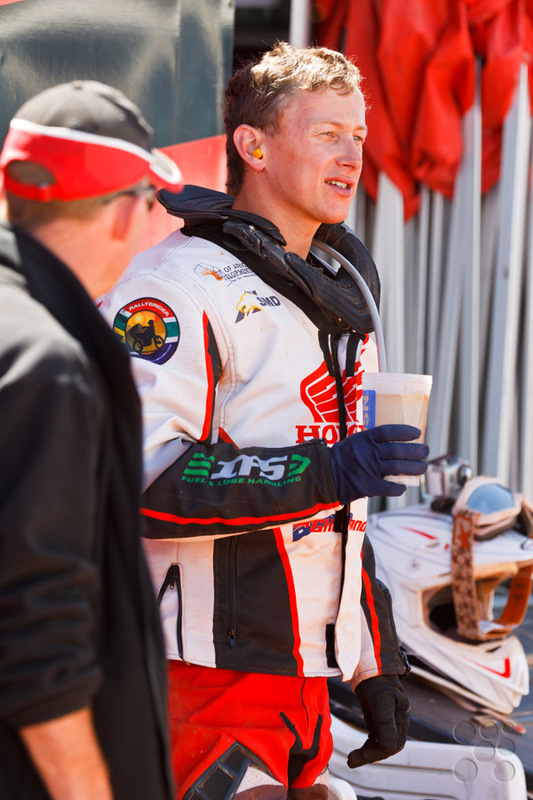 Strange missed a turn and lost a minute making good, but Jacob Smith pushed ahead to make up some useful time. 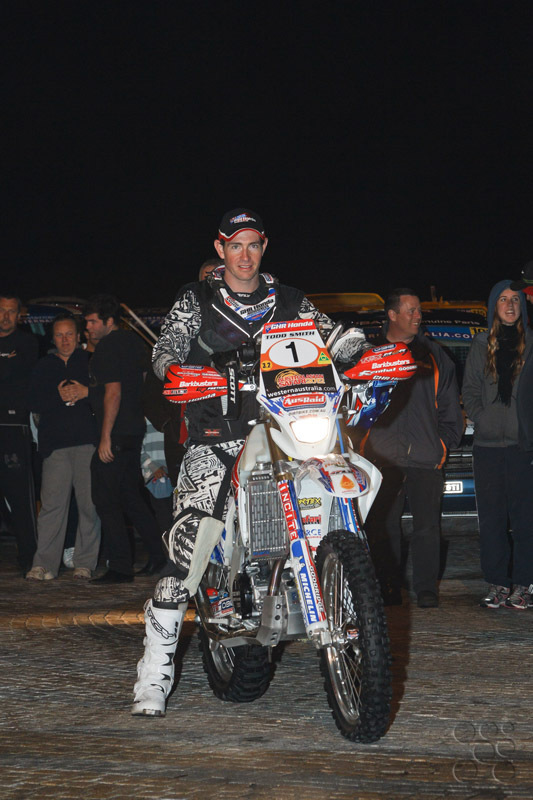 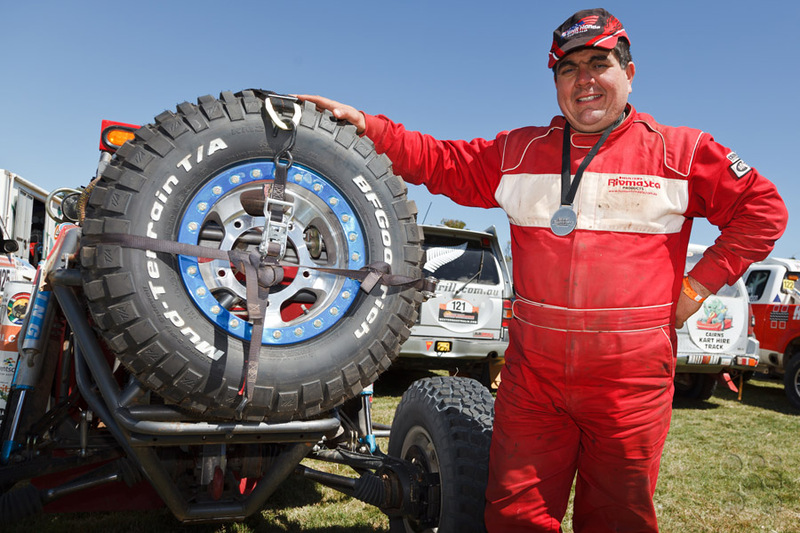 Paul Smith recovered some time after replacing his punctured tyre to end up second in the quad division. 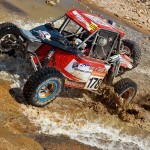 Overall GHR class standings at end of Leg 1. 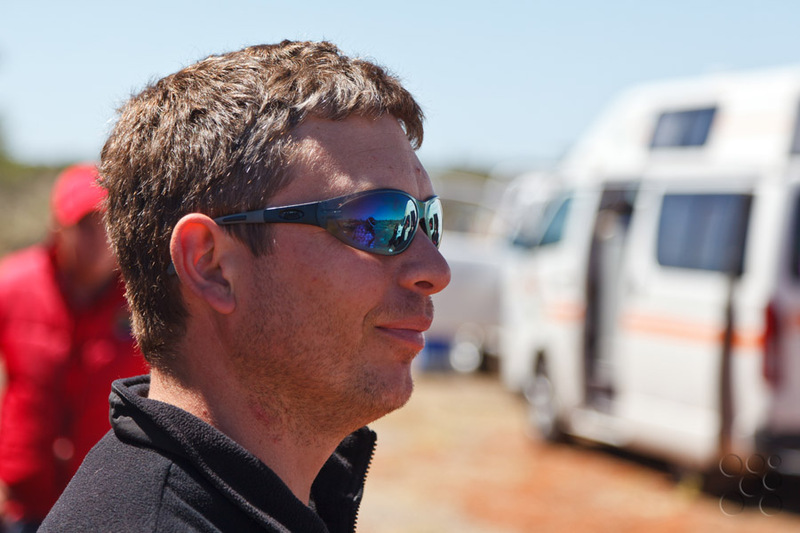 Paul Smith: “The sand and whoops in SS1 were draining and looking at the tracks all over the place people were making mistakes. 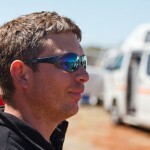 I made some myself but did OK. A flat front tyre in SS2 slowed me down. 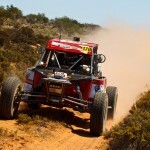 I have to say SS3 was one of the best stages I’ve ever been on. 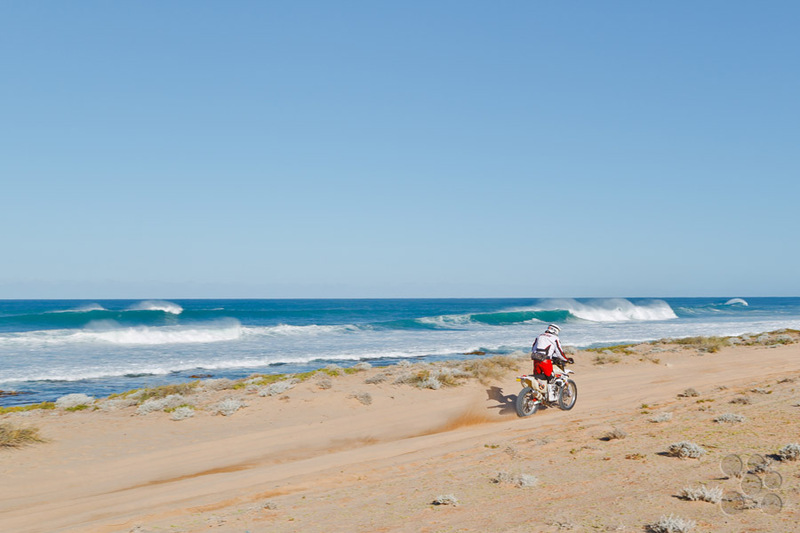 More of that please! 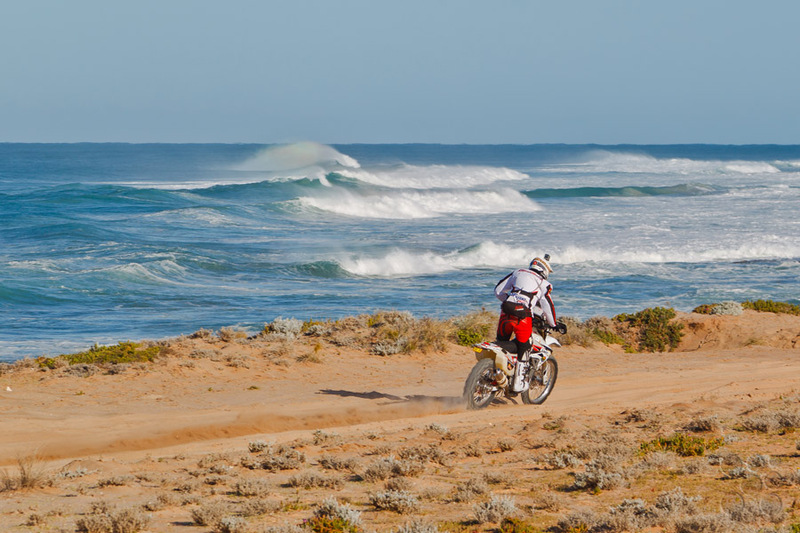 Tomorrow’s Leg 2 Kalbarri – Carnarvon will be a long day for competitors and crews with two timed stages. 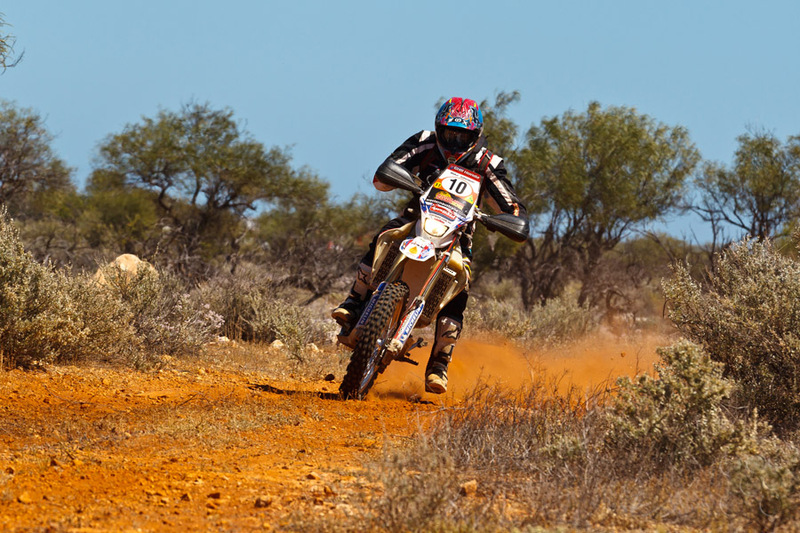 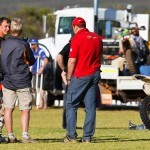 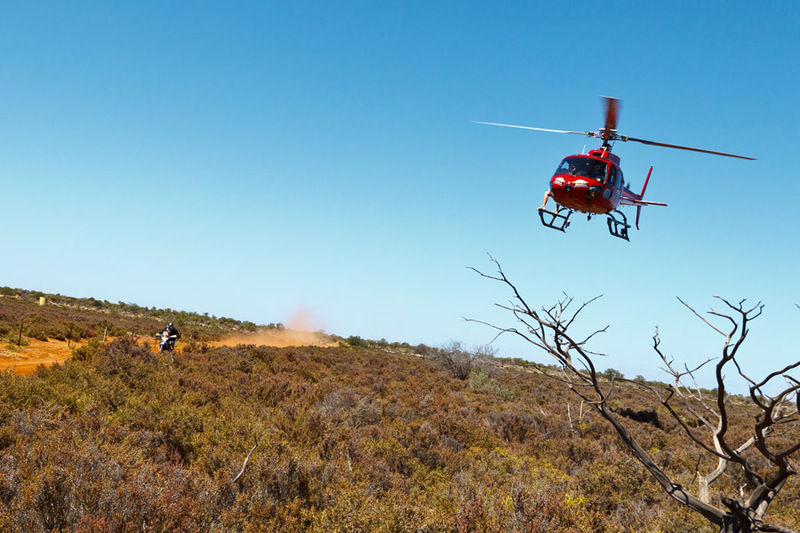 SS4 Kalbarri consists of 230.35kms of mixed terrain and farm tracks before service at Hamelin. 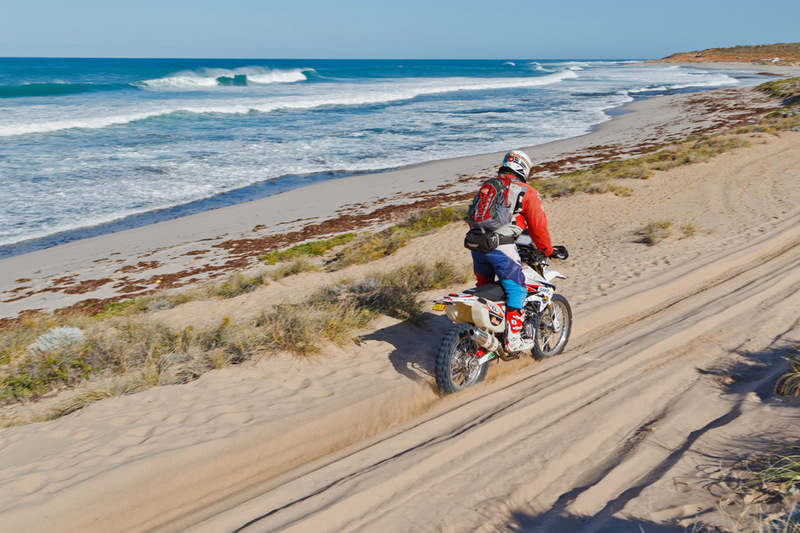 The first half of the 260.62kms SS5 Wooramel River returns to the coast briefly as it rounds Shark Bay Marine Park before breaking inland and heading north. 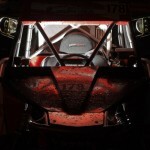 Some pictures from the stormy evening at Hillarys Boat Harbour.